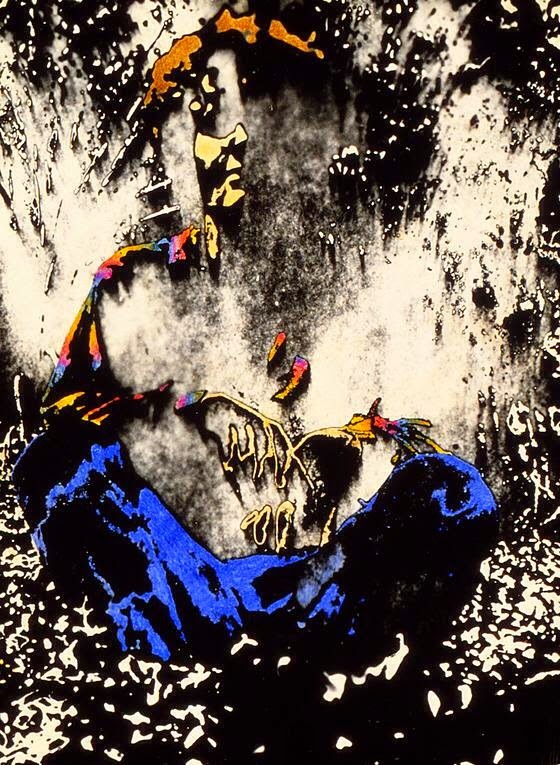 These images were created as part of a class assignment while studying with Robert Heinecken (#RobertHeinecken) at #UCLA in 1968. These are black and white (b/w) photographs that have been highly manipulated in the darkroom, and then painted upon with oils of different transparency value. Heinecken was a very non-traditional photographer who encouraged experimental work. He furthered my approach and thinking about the process of making pictures begun in my first #photography classes at UCLA, taught by Edmund Teske (#EdmundTeske), also a very non-traditional photographer. 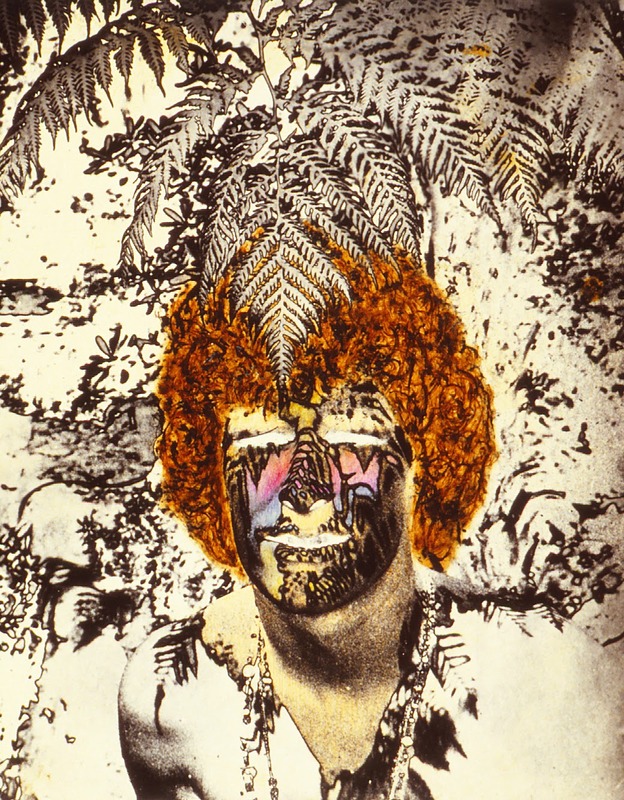 I know my work was also influenced by contemporary graphics as well as many of the rock star personalities I was photographing at the time. I studied/mentored with Edmund Teske, Robert Heinecken, AND Eliot Porter, so this would be my version of environmental portraiture. No wonder I was never very popular among art directors doing annual reports! 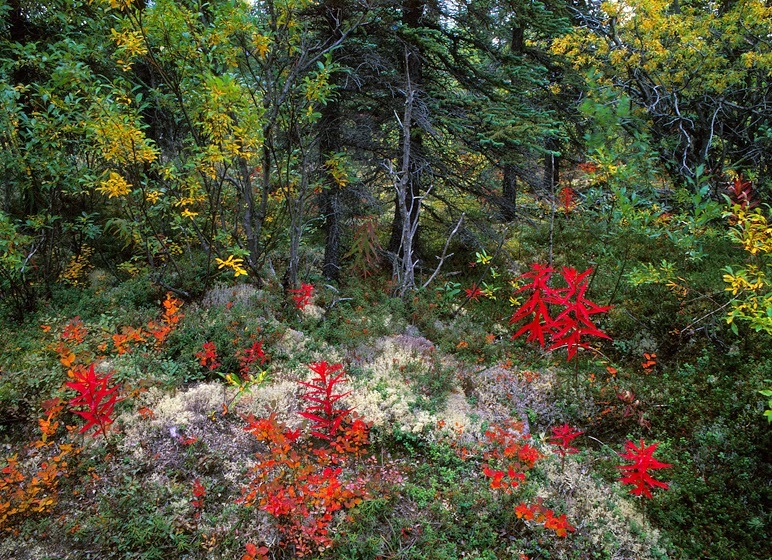 Robert Glenn Ketchum featured in Tommy Hilfiger's new online magazine! Little Bear Productions' Conservation Photography client Robert Glenn Ketchum is featured in Tommy Hilfiger's new online magazine! San Ignacio Lagoon: SAVED FOR the Whales! World-Renowned Conservation Photographer Robert Glenn Ketchum dedicates Tuesday's to the Natural Resources Defense Council's (@NRDC) successful campaign that kept a whale birthing lagoon from industrial development. Laguna San Ignacio Gray Whale Nursery in Baja California, Mexico is best known as the winter home to the once-endangered gray whale. The lagoon lies within one of the largest ecological preserves in Latin America, designated a Biosphere Reserve / World Heritage Site by the Mexican government in 1988. This blog is part of that story. Enjoy! SAN IGNACIO WHALES #90: The bottom line is that A LOT OF PEOPLE showed their human concern for the protection of some amazing fellow travelers on this #planet and now the gray #whales of #SanIgnacioLagoon can continue their long history of using this safe haven as their birthing area and nursery! Thank you #JoelReynolds and #NRDC for inviting me to take part in this. Thank you to Bobbie Kennedy and his family, the Aridjis, Glenn Close and her daughter, and Pierce Brosnan and his son for allowing themselves to be figureheads to this #campaign and for allowing all of us the thousands of pictures, interviews, and words that it took. This was a privilege for me, as well as an education. 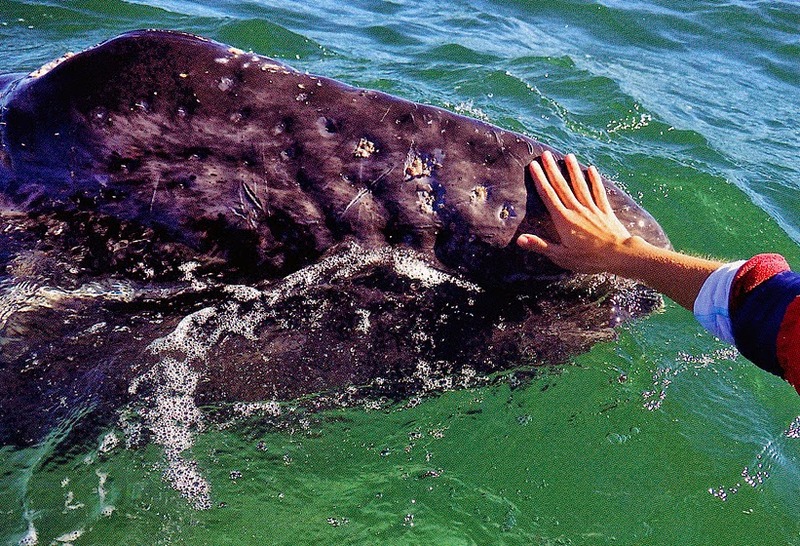 AND a chance to physically interact with one of the largest minds and creatures on this planet. This is the last post of this story, so I hope you have enjoyed what I have tried to relate and that you will take the opportunity to visit San Ignacio, touch a whale, drink some tequila and cerveza and watch the sun rise and set in shimmering radiance of the tidal fluctuations. NO PEBBLE MINE #100, Pictures from Ground Zero: The #rain stopped. The #sky cleared a bit. The #wind died down, so the #lake calmed, and my plane came in... SO let's go flying! We are headed back to #LakeIliamna to continue around the south shore, eventually crossing over the #Kvichak river, and although we will be going back over some of the same #landscape seen coming in, I have NEVER flown over the same landscape on different days or at different times and EVER thought it looked the same. 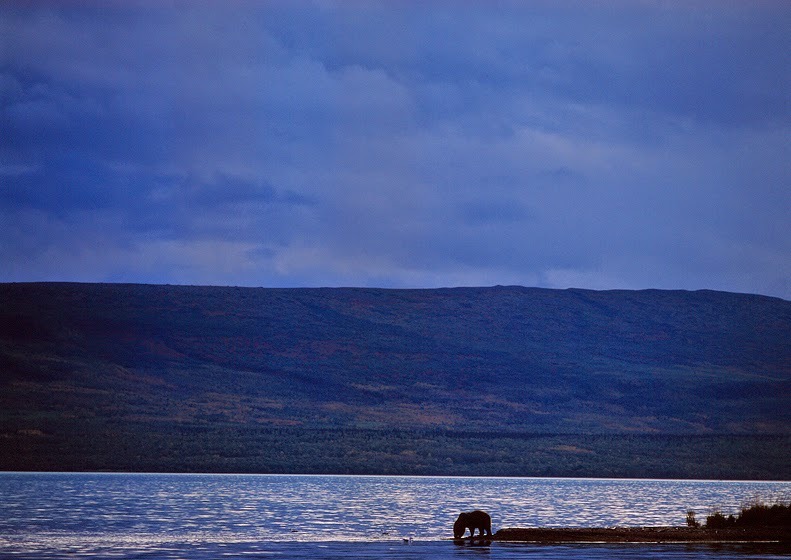 In this view, #Katmai is being left behind and #BrooksCamp and the #IliukArm are now out-of-sight to the upper right. The massively braided #Savanoski river winds across the middle of the frame and our flight path is beginning to cross over some of the myriad of lesser lakes. Down there somewhere are 2,000+ happy bear. Hail Katmai! Hail Wilderness! Happy 50th Anniversary #WildernessAct (@Wilderness)! NO PEBBLE MINE #99, Pictures from Ground Zero: This meadow, quite near to #BrooksCamp, was often the playground of mother #grizzlies and their cubs. After a night of hard rain its grasses are saturated, being whipped about wildly as strong gusts of wind blow through from off the lake. Given the weather, no one is around, not even the bears! As I stood pondering the biological magnificence of #Katmai, the patterns of the wind moving through the grasses became hypnotic. 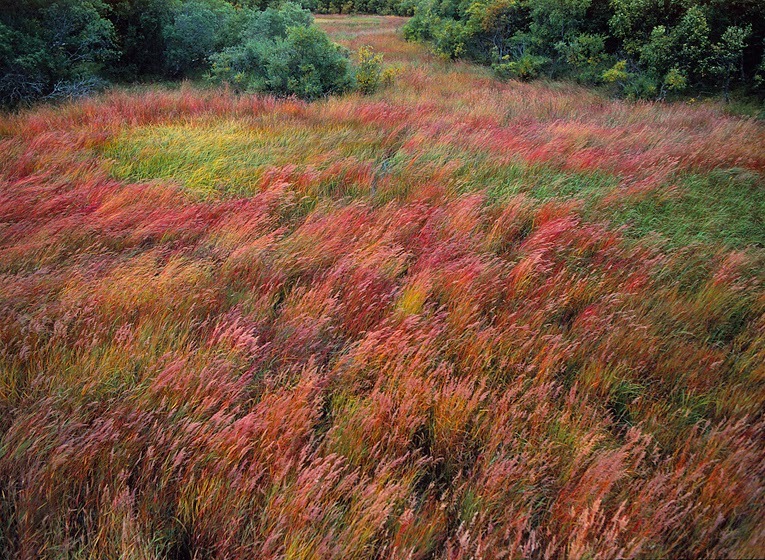 In a VERY Hunter S. Thompson moment, the sound of the wind and the motion of the grasses became transcendental. I felt as if I were flying above this, not standing in front of it. 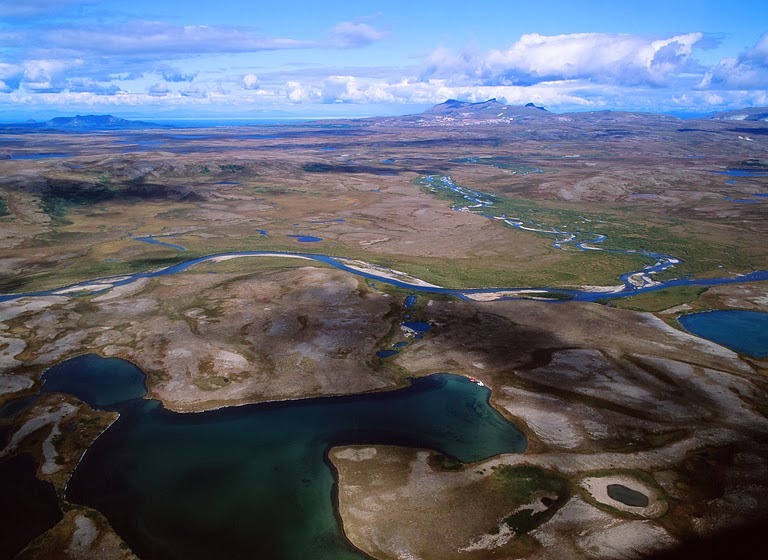 Soon enough, however, I would be in a plane flying above it, headed out of Katmai National Park and Preserve back toward #LakeIliamna and the huge #Kvichak river, as I continue my tour for you of the places that would be affected by the development of the proposed Pebble mine. NO PEBBLE MINE #98, Pictures from Ground Zero: If you have followed this blog, you know I am taking you on a journey through areas of #Alaska that will be affected by the proposed development of The Pebble mine. We have "floated" down the #Nushagak #river from the mine site to #BristolBay. We have gone around the northwestern shore of #LakeIliamna and up the #IliamnaRiver valley. Then we crossed to the southwestern shore of the lake and entered #Katmai National Park and Preserve which I have been highlighting for the last few weeks. Today we will leave Katmai to continue our journey but first, as it was a beautiful, rainy morning, I wanted to walk around #BrooksCamp one more time to enjoy its lush diversity. 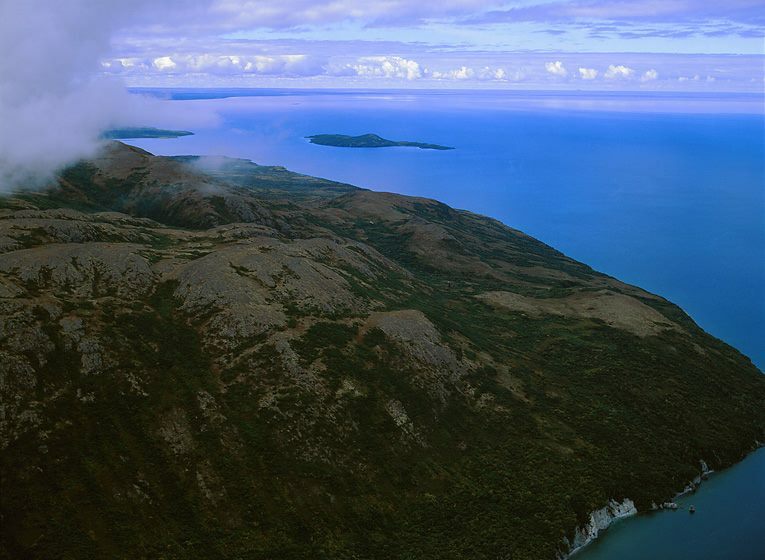 NO PEBBLE MINE #97, Pictures from Ground Zero: #Katmai National Park and Preserve is around 4-MILLION acres, of which 3.3-million is designated #wilderness, SO HAPPY 50TH ANNIVERSARY TO THE WILDERNESS ACT! Katmai is one of its crown jewels. Home to 2,000+ bear, countless other animals, millions of birds and fish, the #Alagnak (a designated National Wild and Scenic River), dozens of volcanoes (many of which are active), and a massive fault zone. Katmai is the SIZE OF TWO YELLOWSTONES, and one of the least-disturbed wild places on the planet. 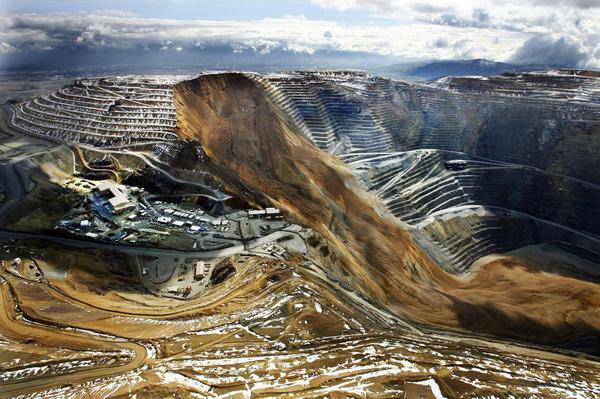 It would seem the largest industrial open-pit #copper and #cyanide #gold-leach #mining complex in the world would make a VERY inappropriate neighbor. SAY NO TO THE PEBBLE MINE! 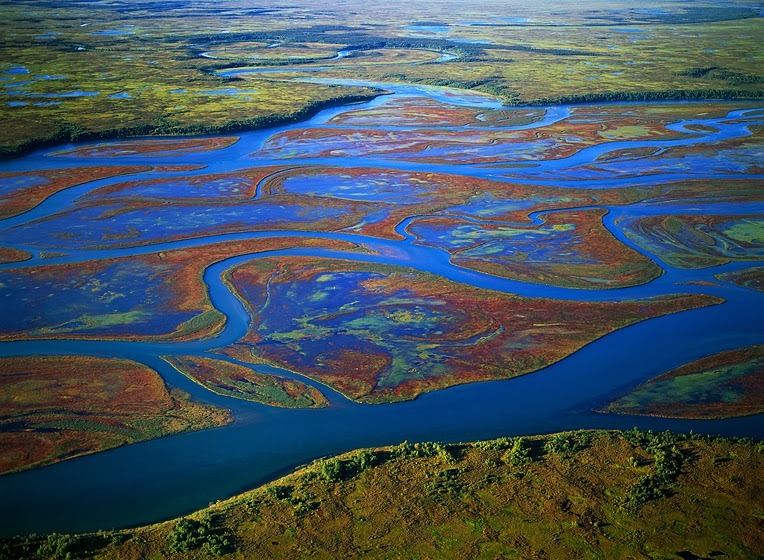 Protect the habitat and fishery of #BristolBay. NO PEBBLE MINE #96, Pictures from Ground Zero: On the bus ride back to #BrooksCamp I continued to ponder the grim little "vision" I had standing at the edge of the #KnifeRiver (see last post). The thought of a #river of #toxins pouring out into this #landscape was chilling. As if to underscore that risk, we were hardly back into the camp zone when we were greeted by this mother #grizzly bear and her cub scavenging the shoreline for dead #salmon. 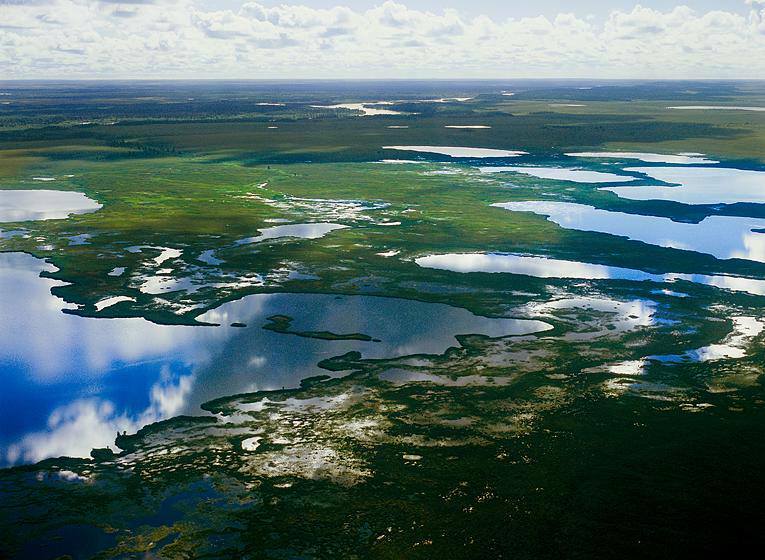 At the risk of repeating myself, I ask you to ponder once again that the #cyanide-slurry #lagoons for the #Pebble mine complex would cover 20-square-miles. 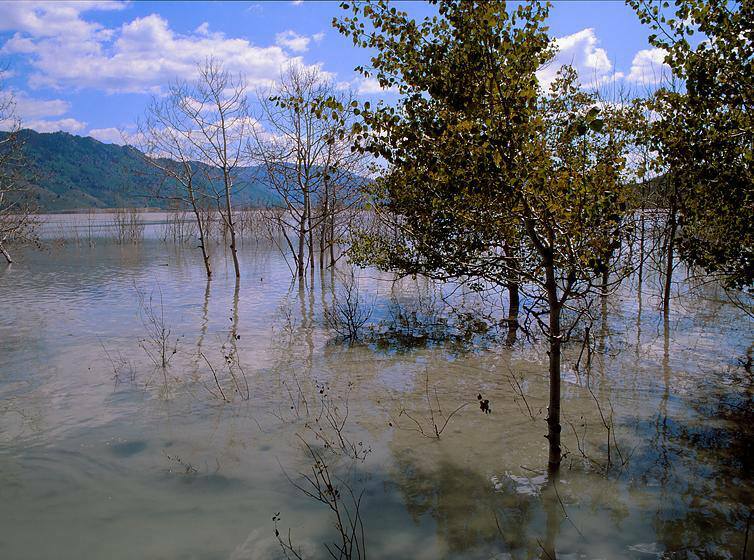 Even if the earthen dams were never breached by #earthquake or #volcanic eruption, how exactly will the toxins be contained and prevented from leaching into the #groundwater? Can ANYONE do that in perpetuity, because #cyanide slurry NEVER breaks down? And, to prevent the moose, bear, wolves, caribou, and many others from mistaking the lagoons for #water, will the mining consortium have #Halliburton build a "fence" like the one they have on the US border? Will one of the sports arena designers suggest they can also construct a dome over the lagoon so the MILLIONS of birds on the #PacificFlyway don't land here? NO PEBBLE MINE #95, Pictures from Ground Zero: The return to the bus required ascending a trail from down in the #KnifeRiverValley. At this pause you are looking up-valley, #Novarupta #crater and other #volcanoes still active are about twelve miles distant. As I stood enjoying the view and pondering the reason that brought me to #Katmai - the nearby development of the Pebble mine - this particular vista allowed me a terrific grasp of a possible reality were the mine to be built. The Pebble mine proposal calls for 20-square-miles of #toxic #iron #oxide-cyanide slurry "lagoons" contained behind earthen dams larger than 3-Rivers Gorge in #China. How do you keep animals from drinking from this? How do you keep the greatest #bird #migration in the world from landing on it? Such a place would be the size of this valley but the dam walls would be higher... until another epic #earthquake or #eruption in the area. Then the contents of the #lagoon would look like this and be flowing out from behind the shattered dams and into a vast wild #landscape and #groundwater system headed for #BristolBay - The Last Great Salmon Fishery. 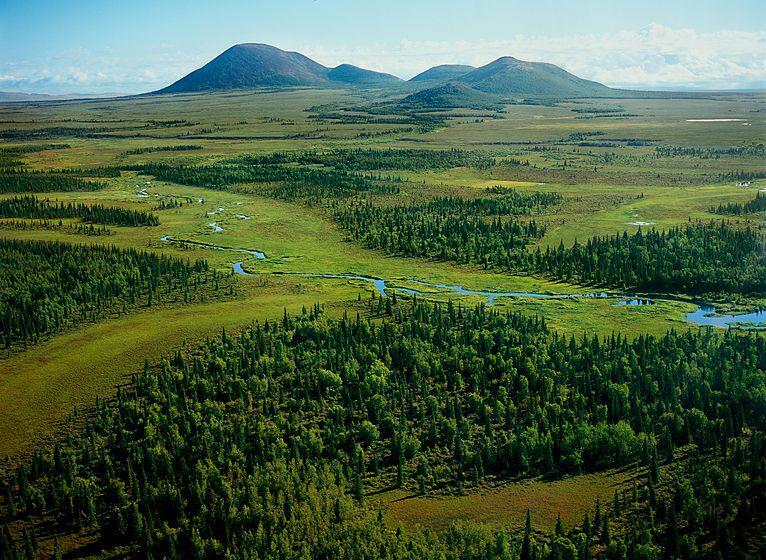 Tell Northern Dynasty to abandon this terrible project - SAY NO TO THE PEBBLE MINE!!! NO PEBBLE MINE #94, Pictures from Ground Zero: Because I was a "daytripper" on the daily bus the National Park Service (#NPS) provides for guests to visit the #Valley of 10,000 Smokes, I only had a limited time to walk and explore. I covered some miles of distance and found some VERY strange-beautiful places, but I think it would be a fantastic experience to hike and camp throughout this 12-mile valley of #volcanic ash desert. As the #rivers reasserted themselves, their relentless carving has cut through many layers of volcanic debris from the #Novarupta #eruption. With the rivers exposing and eroding these different layers, the #shorelines are littered with rocks and stones of every imaginable color and tone. 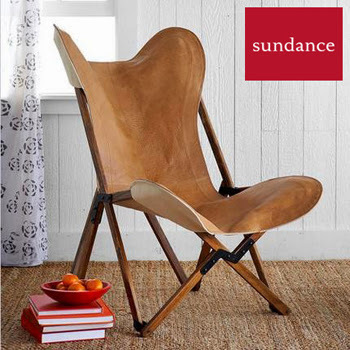 Some of the largest are sometimes also the most lightweight, and some smaller stones have the density and heft of lead. It is a weird world that does not look like it supports much life, but I know there are also animals out there somewhere... wolves? NO PEBBLE MINE #93, Pictures from Ground Zero: Hardly active and relatively stabile, today the #Valley of 10,000 Smokes in #Katmai National Park is an amazing #terrain to hike in. 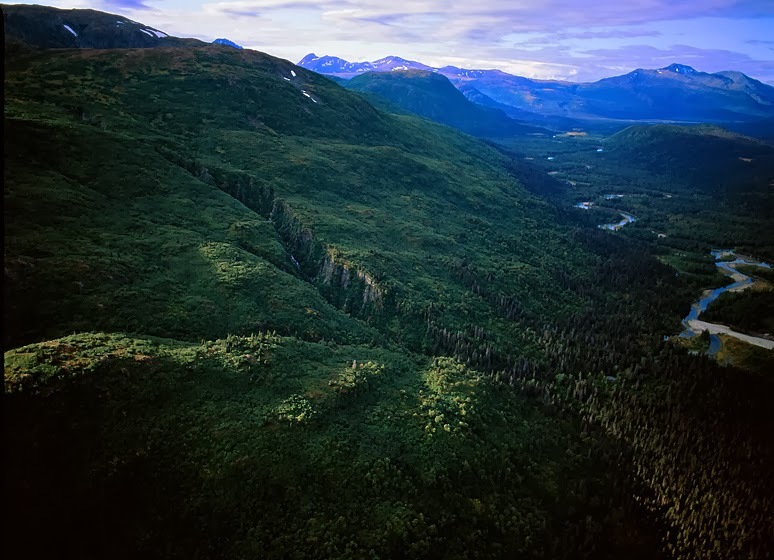 #Trails have been well established connecting a few huts and the nearly vegetation-free #landscape makes off-trail walking less difficult than struggling with the dense bush in the rest of Alaska. A strange-beautiful moonscape, here I am standing in the valley of the Upper #Ukak River, which over the decades has cut through about 250-feet of #ash, finally reaching #bedrock. Imagine an event the scale of the #Novarupta #eruption occurring again and the effect it might have on some of the proposed plans for the PEBBLE MINE. 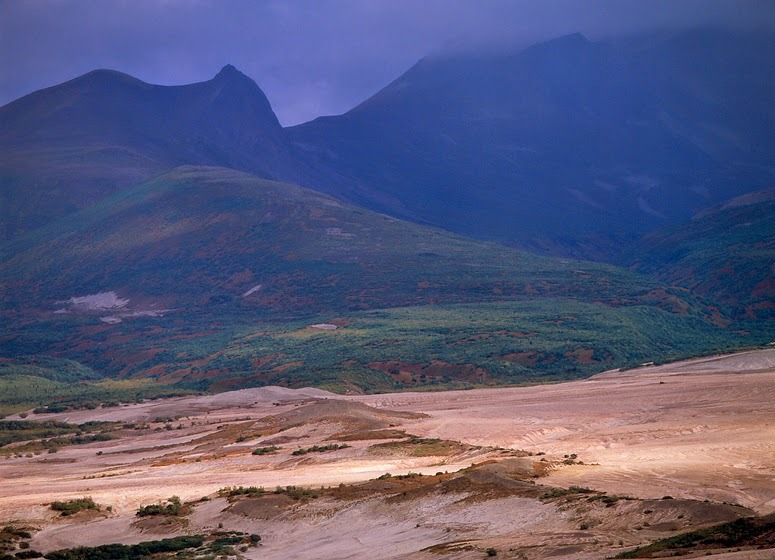 NO PEBBLE MINE #92, Pictures from Ground Zero: On June 6th, 1912, #Novarupta #volcano in #Katmai National Park exploded in a 3-day event that that was 30 TIMES MORE POWERFUL THAN THE ERUPTION OF MOUNT ST. HELENS. The initial #explosion created the most extensive #pyroclastic flow ever documented. 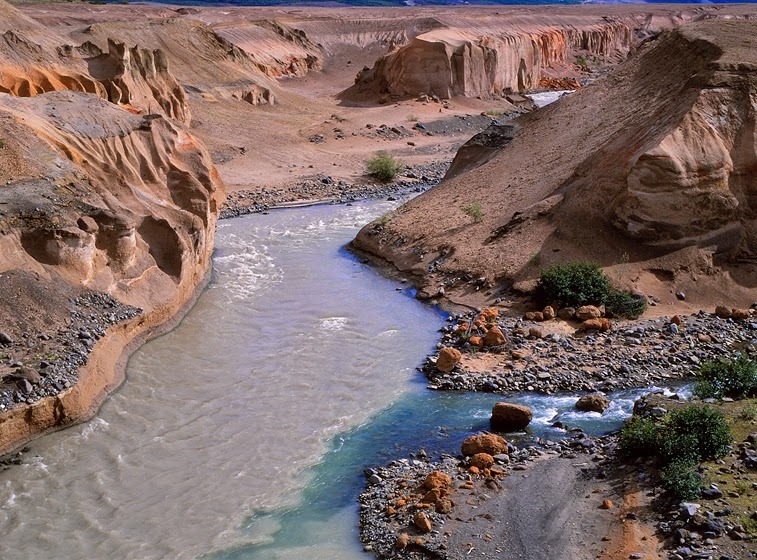 Parts of the flow swept miles down the valleys of #KnifeCreek and the upper #Ukak River, incinerating all life forms. And then, in the ensuing hours, #ash deposits buried both #rivers, turning their V-shaped #valleys into smoldering flat plains of steaming #fumaroles. #Ash from this #eruption reached Africa! 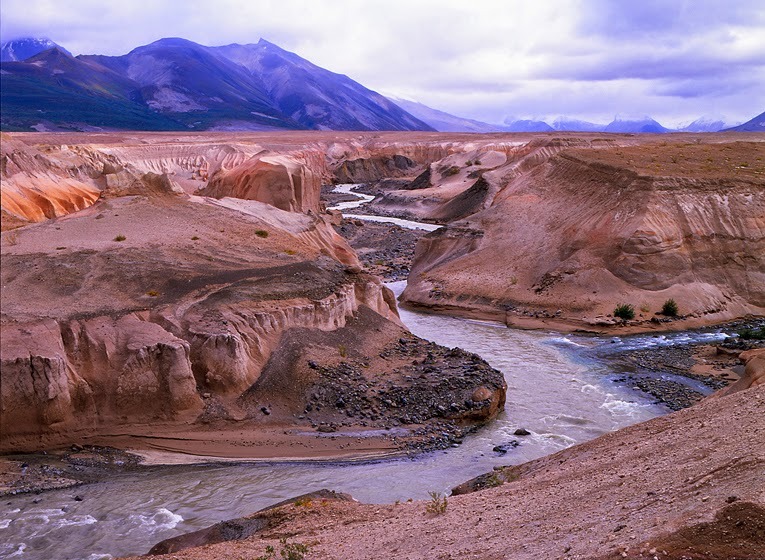 In the years since then, The Valley of 10,000 Smokes has stabilized and cooled, becoming a hiking and backpacking attraction within Katmai park. 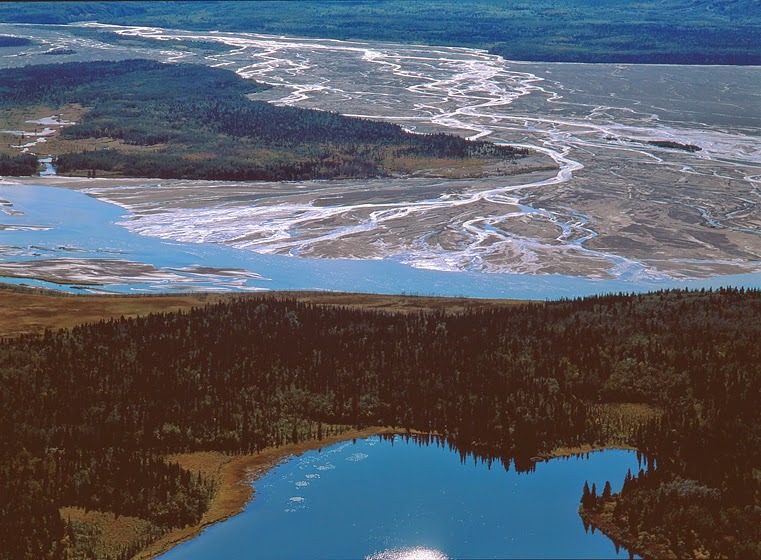 In this post you are looking at the Knife River and a confluence with a small #sidestream, as the collective #waters have reestablished a river valley, cutting through hundreds of feet of ash deposit. 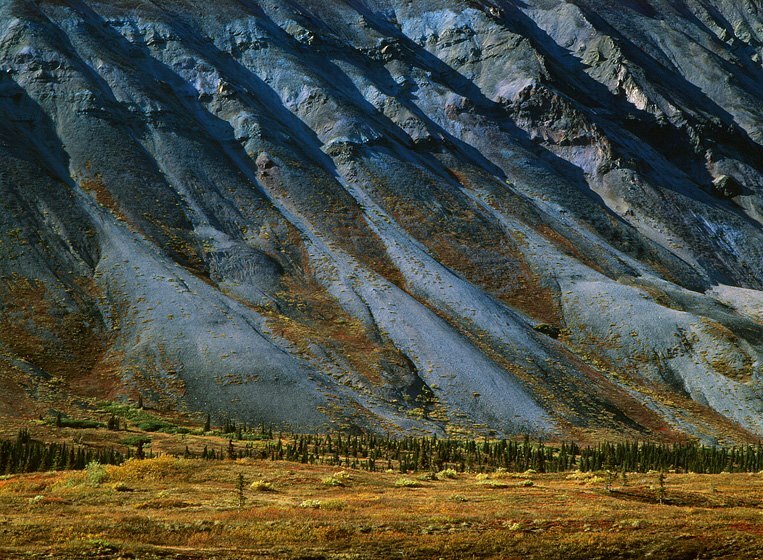 NO PEBBLE MINE #91, Pictures from Ground Zero: After the lush #valley, the road rises briefly again and almost immediately things start to change. We will find the shelter hut overlooking a large, high #river valley, that runs west through #Katmai towards the #Pacific Ocean. But, as we approach the hut the #tundra covered hillsides suddenly begin to look like a desert of #sand dunes. We are at the edge of the ash debris and pyroclastic flow from an epic eruption. In 1912, #Novarupta volcano began a violent 3-day event that is considered greater than #Krakatoa and THE most powerful eruption of the 20th Century. When it blew, people over 750 miles away in #Juneau heard the blast 1-hour after it occurred!! 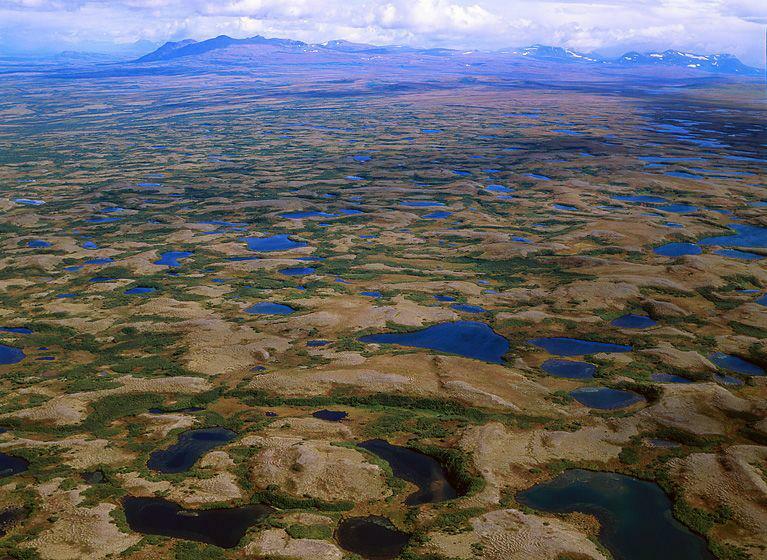 NO PEBBLE MINE #90, Pictures from Ground Zero: As the road nears it's destination, it levels off briefly in a lush valley of #beaver #ponds surrounded by #tundra #foothills densely covered in vegetation. 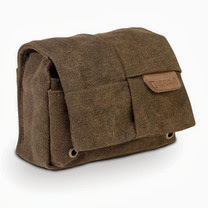 Drink in this beauty as it will stand in stark contrast to where we are going. When you see all of these living things before you in such an expansive #landscape, it is hard to imagine that they could all be wiped away in seconds by an act of #nature, but this is The Ring of Fire and just up the road we are going to be provided with a viewpoint and a small shelter hut that overlooks a spectacle of destruction consider one of the greatest #volcanic events in human history. 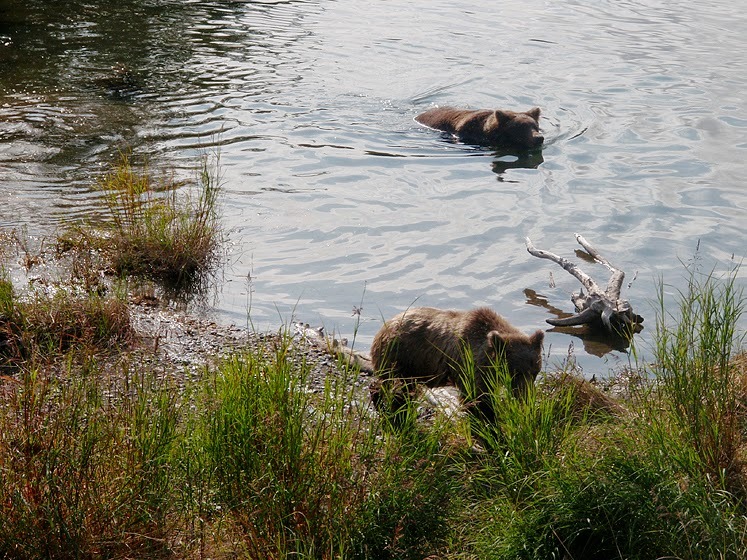 NO PEBBLE MINE #89, Pictures from Ground Zero: #Katmai National Park has another interesting feature besides the attraction of the fish and the bears. 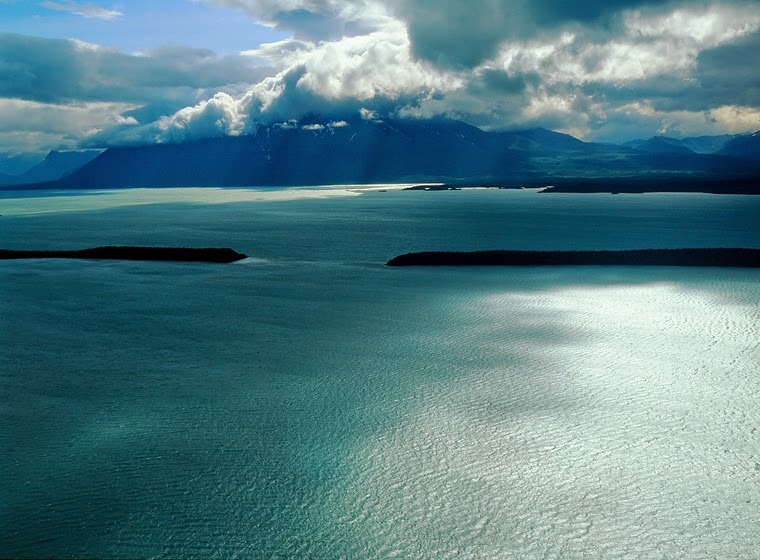 Katmai is a significant hotspot on The Ring of Fire. 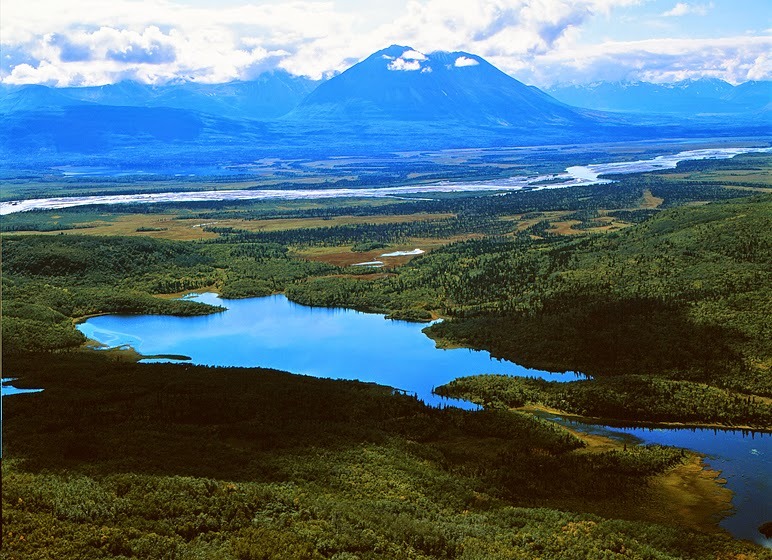 The #Alaska and #Aleutian Ranges are one of THE most #seismically active areas in the world and Katmai, specifically, is one of the world's most active #volcanic centers (HELLO - good reasons NOT TO BUILD THE PEBBLE MINE anywhere near here!). Five of the 16 volcanoes within the park are considered active, and there have been eruptions in recent decades. SO, I am traveling up this valley that is navigated by one of the few short roads in the park - there are plenty of fish in the river, the surrounding spectacle of peaks and terrain is magnificent, moose and bear appear occasionally... BUT I am on this road because it is taking me to a very unique destination. NO PEBBLE MINE #88, Pictures from Ground Zero: Within #Katmai National Park and Preserve, there are as yet no fish camps as permanent structures, but the National Park Service does permit guide groups who create lodging like this. It may look "rustic" but the tent-cabins are warm and dry, the meals are good and often part of the fresh catch, the privy has a great view, AND it is a clean sightline from the tents so you can see if #bears are around. From here - float, fly-in, fish the shoreline - all advised by guides. Less tips to those guides, the pricing of this wilderness fishing runs between $500-$1,000 per day, usual with a minimum stay of 5 days. Men and women who love to fish come from ALL over the world to fill many camps like this during the season. Outside the park, at the private lodges that ARE permanent facilities, well, those prices are a whole other blog! 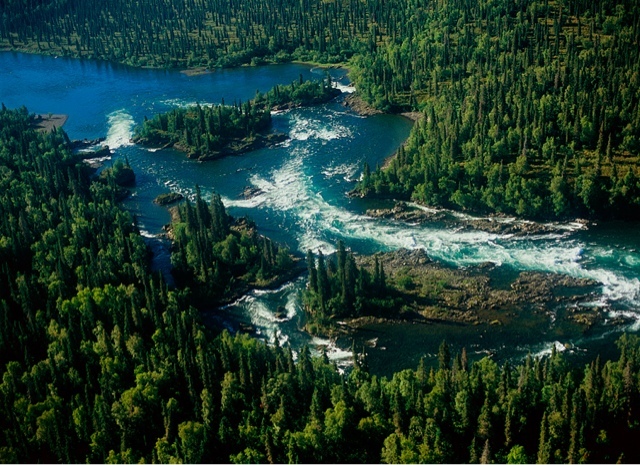 NO PEBBLE MINE #87, Pictures from Ground Zero: Many sport fishermen consider the Alagnak river in Katmai one the most outstanding destinations in the world. 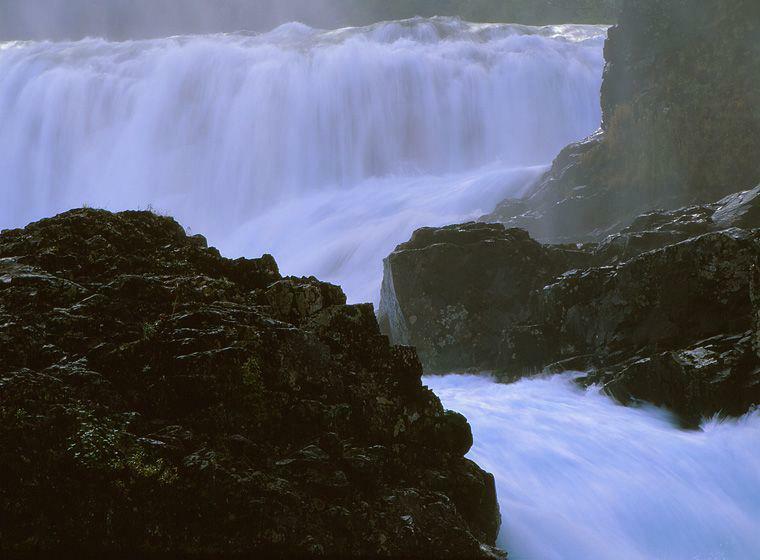 Designated a National Wild and Scenic River in 1980, the 60+ miles of the upper Alagnak lives up to the appellation. Besides all five species of salmon that run the river, it is also host to HUGE rainbow trout, grayling, char, and pike. 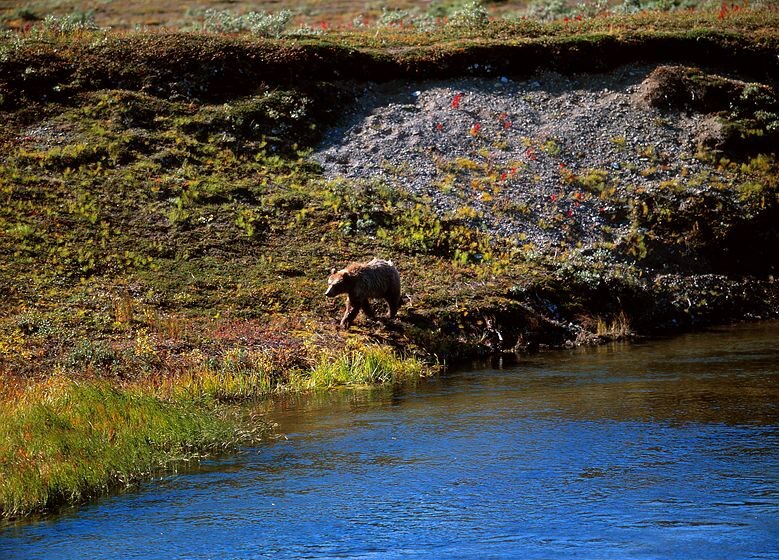 The abundance of the river corridor supports many non-aqautic species as well including fox, wolverine, mink, wolf, eagles, beaver, otter, caribou, moose, and a VERY SIGNIFICANT population of both black and brown (grizzly) bear. 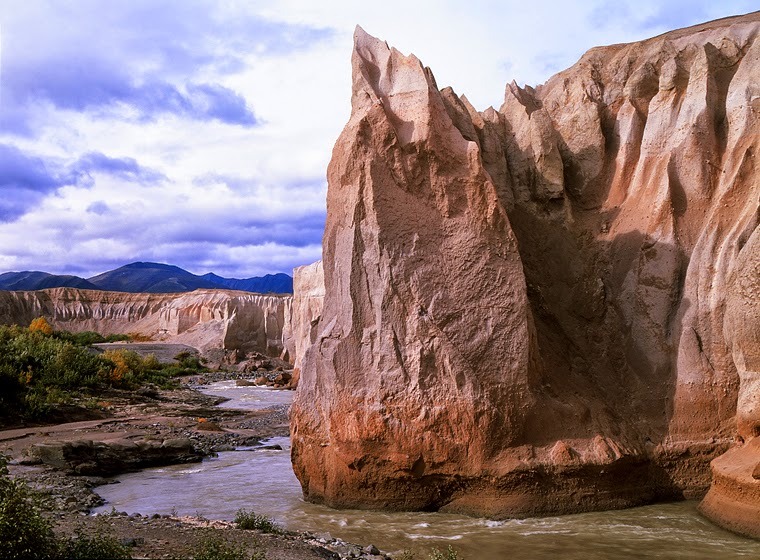 There is also a section of the upper river that narrows into a steep canyon offering a Class 1 thru 3 whitewater challenge that gets considerably trickier after a big rain when the river is high and flowing fast. NO PEBBLE MINE #86, Pictures from Ground Zero: Another entire group of recreation users that love #Katmai National Park and Preserve are the #fishermen. Some work the #lakes and #river mouths from boats, or with #waders #onshore. The true "wilderness" fishing in Katmai, however, is on the big #rivers. 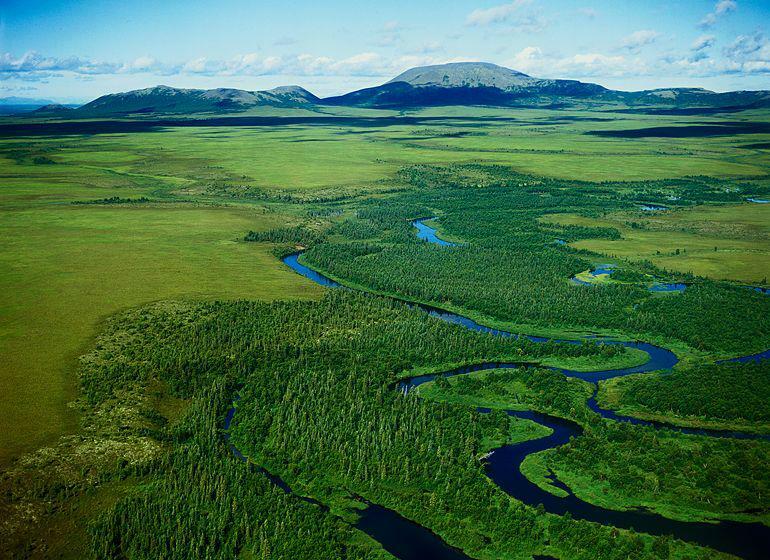 Here, the broad meandering #SavonoskiRiver wends its way toward #NaknekLake. The Savonoski can be floated using a small plane to get to the starting point, or it can be approached from #Brooks Camp by boat, canoe, or kayak. Walking around out there and fishing the braids can be spectacular, AND very productive; as long as you are watchful and recognize that you are NOT THE ONLY ONE fishing these braids. NO PEBBLE MINE #85, Pictures from Ground Zero: Then there are those days that are spectacle, but really not fit for man nor beast. Neither the boatperson, the fisherman, nor the hiker find much refuge from this. There are also those that just don't care - the #bears! Once on a day like this, I sat in full raingear on the edge of the forest at the shore, and slightly sheltered by the dripping trees, watching two young, but sizable, male #grizzlies, quite literally bodysurfing 3-4ft shorebreak waves that the high winds were driving onto the beach. They totally had it down! My friend Nick Nichols at #NationalGeographic (@NatGeo) says he has seen #hippos in #Africa doing this as well. 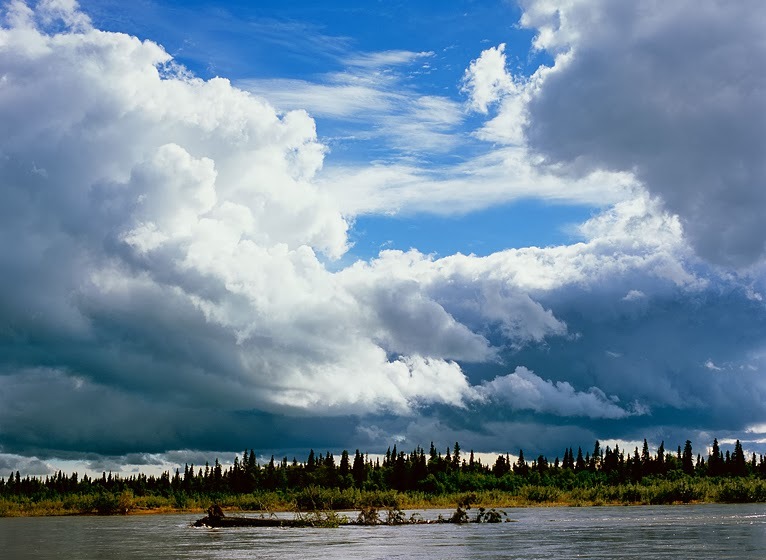 NO PEBBLE MINE #84, Pictures from Ground Zero: The mixture of moisture-laden #weather off the #Pacific and the taller summits of #Katmai National Park create a daily sky show. On the best days, it is a great thing to watch from one of the parks lesser #summits. As a rule, however, this weather is pretty fast-moving and usually has significant wind with it, so regardless of your viewpoint, YOU need to be prepared as some part of the storm will eventually reach you. Hikers can hunker down, but out on these big #lakes it is another story. The scale of this #water allows the #wind to build up significant #wave fetch which I have seen come ashore as 6-FEET of surf at #BrooksCamp. Timing a paddle crossing from one #shore to another requires critical weather judgment because these #storms sometimes come up very quickly, and it isn't just the struggle of the paddle; getting ashore may be an even bigger adventure. 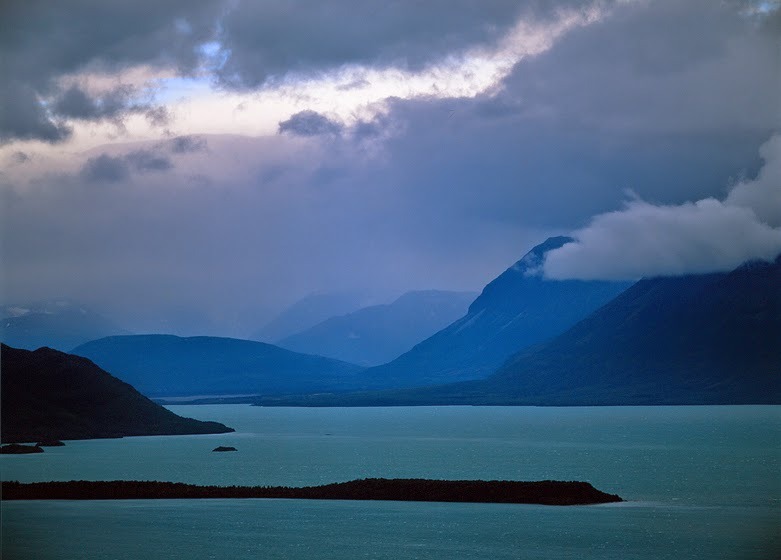 NO PEBBLE MINE #83, Pictures from Ground Zero: #Katmai National Park and Preserve may be best known for the bears, but there is much more to enjoy than just that. This is TRULY wild country, but there are trails to hike, and you can also stroll the considerable shoreline, as long as you are willing to "share" it with the bears, as they like to stroll along it as well. The lakes offer day-fishing charters, canoe and kayak camping, and I have always been a fan of the spectacle "where the mountains meet the water." 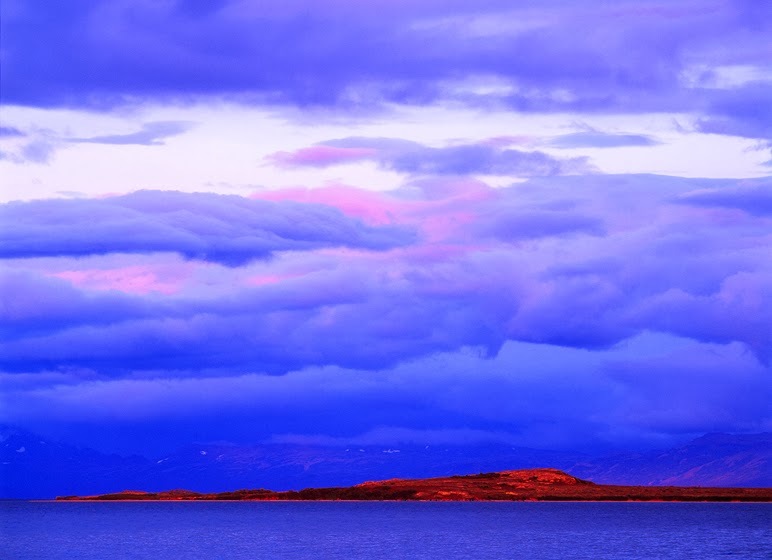 The sheer size of these #lakes and the height of these #mountains which draw in #weather off the #BeringSea create a daily sky-show that can be breathtaking to watch, ...and if you're canoe/kayak camping, breathtaking to endure! NO PEBBLE MINE #82, Pictures from Ground Zero: #BrooksCamp is marginal lodging and food provided by the National Park Service (#NPS), but what is lacking in amenities and convenience is made up for because of the positive interaction with #bear most visitors have while at the camp. Brooks Camp is located in the trees at the mouth of the #BrooksRiver where it enters #Naknek Lake. The main viewing area for watching bear is a series of falls farther up the river from camp, BUT when #salmon are running, bear are EVERYWHERE. These cubs are feeding in the rivermouth in front of camp while more salmon splash in the background. I am standing on a shoreline less than 100-yards from my cabin. Bear have been walking through camp and along this beach ALL DAY!! AND, FOR THOSE THAT DO NOT KNOW THIS, #RIOTINTO, THE LAST SIGNIFICANT PARTNER IN THE DEVELOPMENT OF THE PROPOSED #PEBBLEMINE, HAS WITHDRAWN. These animals and the amazing parks and habitat that support them have a reprieve from massive industrial development. Now lets see if we can do something with this resource to utilize it meaningfully without destroying it and those who live there. NO PEBBLE MINE #81, Pictures from Ground Zero: Finally our flight enters the most public part of #Katmai National Park and Preserve. We are above the #Iliuk Arm of #Naknek Lake, colored in this way, in part because there is much glacial till suspended in the water, and partly because the incredibly still lake is reflecting blues in the sky. Directly in front of the plane's view is Mount #Katolinat and flowing from its feet, off to the left, is the braided and meandering flood plain of the #Savonoski river which comes into the Iliuk Arm. Off to the right, and at this scale invisible in the trees, is #BrooksCamp - lodging, food, and other services provided by the National Park Service to give the public access to this amazing wild place and let them have a safe, up-close-and-personal experience with the magnificent grizzly bears that are, quite literally, everywhere. NO PEBBLE MINE #80, Pictures from Ground Zero: As our flight proceeds, the heart of #Katmai National Park and Preserve begins to unfold beneath us. Big, perpetually snow-clad #mountains are everywhere, as are big #rivers full of #salmon and #trout, and large beautiful #lakes. We have entered designated #wilderness and it IS #wild. The abundant #habitat provides food for a lot of predators of which #bear and #wolves are most visible. 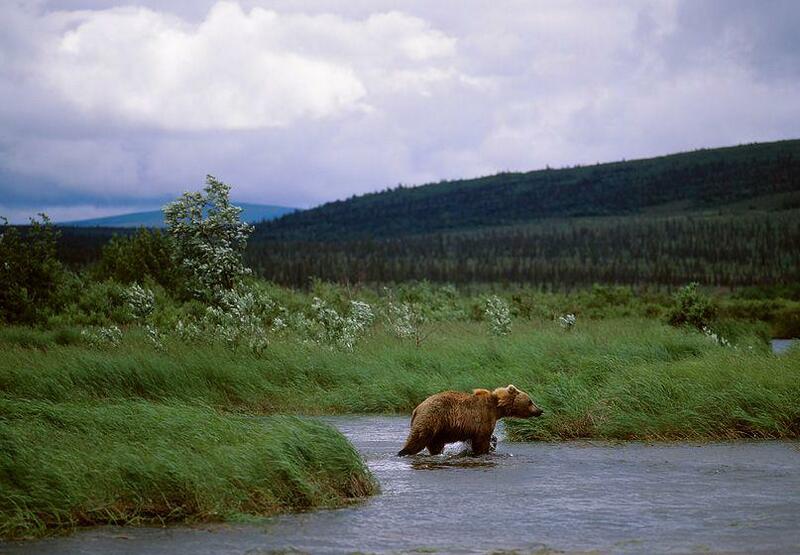 In fact, Katmai is considered one of the greatest bear-viewing experiences in the world. #BrooksCamp is lodging services provided by the National Park Service. It is always filled with international guests because it is walking distance to a river / #waterfall system that features dozens of bear in close proximity to the safe viewing platform while bear compete for salmon running up the river. Those same bear also amble through camp on a regular basis providing further "excitement" for those walking between their cabins. NO PEBBLE MINE #79, Pictures from Ground Zero: As you leave the presence of #LakeIliamna and enter the domain of #Katmai National Park and Preserve, the #rivers remain everywhere but the steeper terrain hosts less #tundra #ponds and more significant #lakes. This is some of the most beautiful, wildest, and most exciting recreational #fishing, #floating, #camping and #kayaking that you might every do in your life. 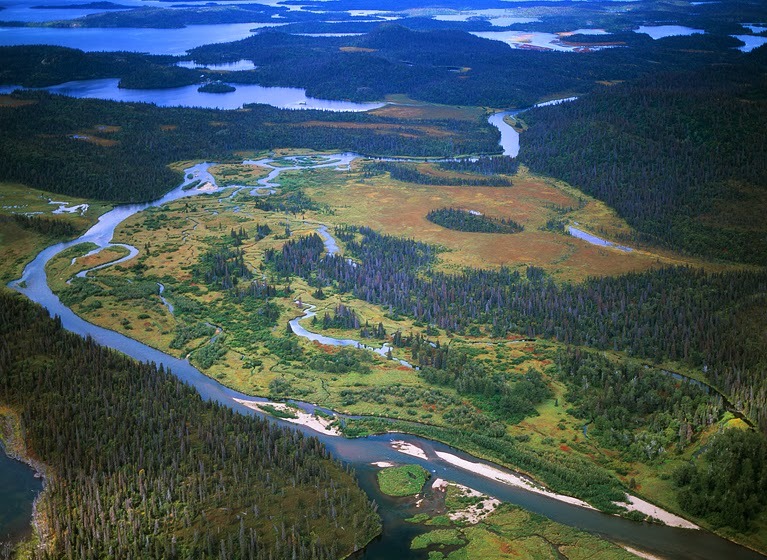 These many rivers are a significant part of the multi-million$ RENEWABLE recreation industry growing in this region and although they would not be directly impacted by the construction of the proposed Pebble mine development, the ENTIRETY of this park would have its air and water quality significantly affected. NO PEBBLE MINE #78, Pictures from Ground Zero: Flying south, away from the southern shore of #LakeIliamna, our flight path heads for #Katmai National Park and Preserve. #Lakes grow larger and there are less small #ponds, but #rivers are everywhere. At the horizon of this picture Lake Iliamna is in the distance and beyond it rise the mountains of #LakeClark Park and Preserve. In the lower half of the frame, a relatively large river system winds itself past a couple of #lakes, and if you look carefully at the one in the foreground, you will see two airplanes have landed on the water and are sitting in a spot of sunlight. Most likely the occupants have come to fish the less accessible stretches of this river. 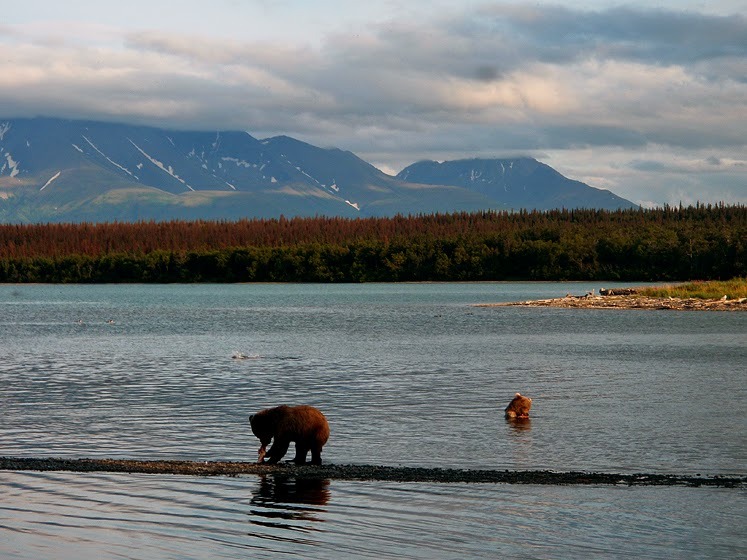 NO PEBBLE MINE #77, Pictures from Ground Zero: #KatmaiNationalParkAndPreserve is a fisherman's paradise but the park is publicly well-known as one of the greatest bear-viewing areas in the world. As our flight follows the southern shoreline of #LakeIliamna toward #Katmai, increasingly more bears become visible in the landscape. In this image, where a small #river flows into the #lake, you can see numerous seagulls in the water and along the edges of the sandbars. They are there because #salmon are spawning and coming up the #stream. The seagulls are "cleaning-the-beach" feasting on spent salmon carcasses. However, they are not alone! Look very carefully at the sand spit where the river enters the lake on the lower, left of this image - there are two very large grizzlies cruising the shore. NO PEBBLE MINE #76, Pictures from Ground Zero: Leaving the #IliamnaRiverValley which we flew above in the last few posts and returning to #LakeIliamna, my flight now follows the southern shore of #Iliamna (seen in the background) as I begin to approach the perimeter of #KatmaiNationalParkAndPreserve. 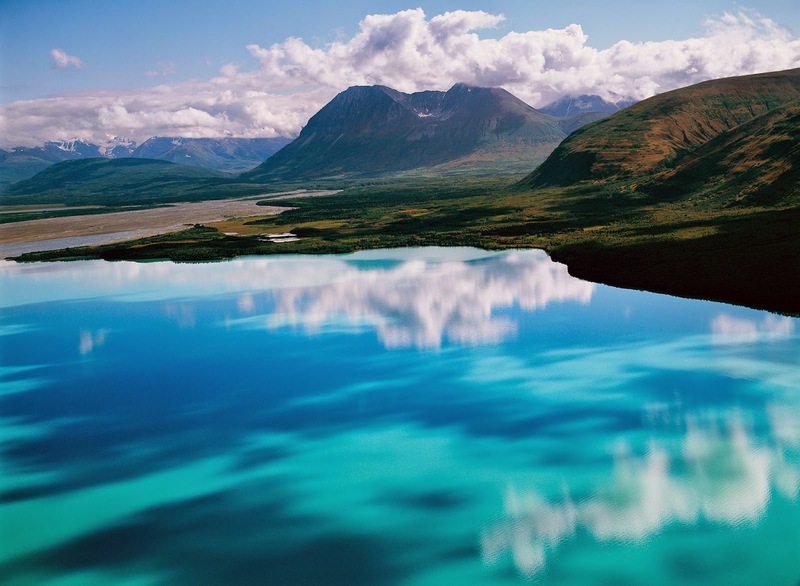 ##Streams, #tundra ponds, and smaller #lakes stretch out over the #landscape unto the #horizon. There are MANY #bear, #caribou, and #wolves down there, ...and LOTS of #fish, #fishermen and #fishing. 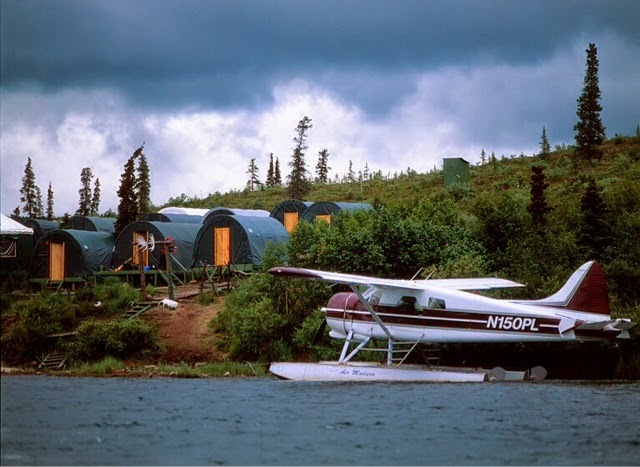 Very few human beings have ever walked large parts of this #landscape and the ones who do are either #Native #subsistence #hunters or fishermen that have landed a float #plane on one of the lakes. What a world! 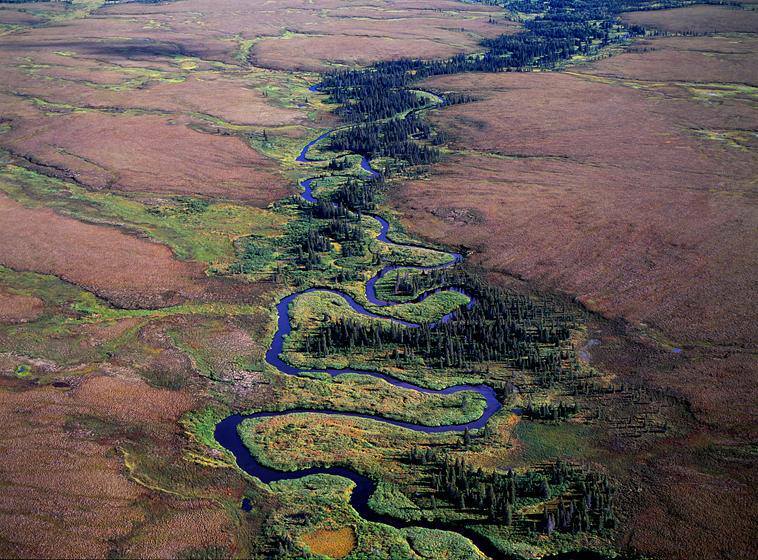 NO PEBBLE MINE #75, Pictures from Ground Zero: Eventually the #IliamnaRiverV valley narrows and becomes a maize of meanders, braids, and inflowing sidestreams. If the haul road for the proposed #PebbleMine were built here, how much "engineering" of the #river will be required? How many bridges will have to be built, disrupting how many #salmon streams? AND, if all of this construction is done, how much of the #soil and #debris from it will flow downstream and into the pristine waters of #LakeIliamna? NO PEBBLE MINE #74, Pictures from Ground Zero: Expanding your view out in front of the plane, you are now looking up the #IliamnaRiverValley (right) and are beginning to get some sense of this valley's size. Building a substantial haul road through this valley for the #PebbleMine will alter the habitat of this river FOREVER! Note, too, it is not ONLY the #IliamnaRiver that would be affected. There are hundreds of streams feeding into the main river. In this picture, directly in front of me (middle of picture) is a deep #canyon, carved by a considerable flow of water. These "feeders" descend into the valley from all sides, and building a road will cause them to be "engineered" as well. NO PEBBLE MINE #73, Pictures from Ground Zero: Scale in #Alaska is often difficult to determine, but these next few images will help clarify the size of the #Iliamna river valley. In the previous post, the view is from the valley, looking toward #LakeIliamna. This shot is the reverse position, looking just slightly up the river valley. With the plane at a lower altitude, details begin to define size. Trees are sometimes helpful, but for me the considerable amount of large debris logs on the sandbars give me the clearest sense "how big" things really are. The angle of the plane is also reflecting clouds and blue sky off of the water. 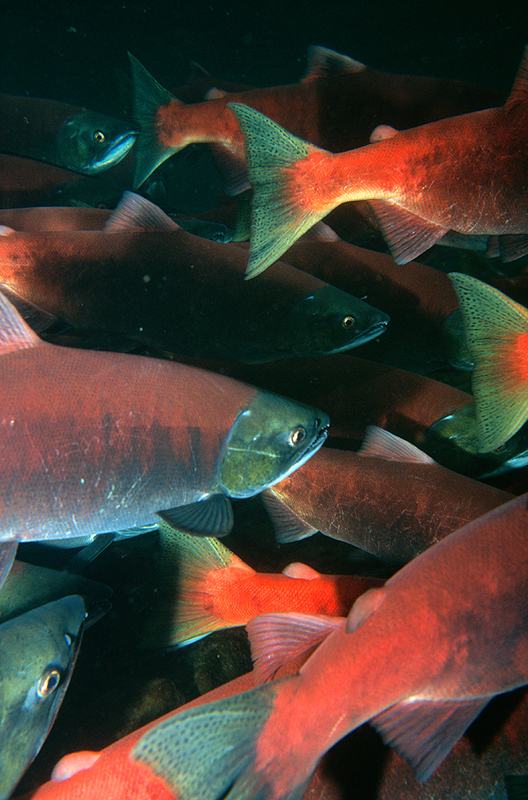 #Salmon were running at the time and particular spots in the river would suddenly turn red with their densely packed bodies. NO PEBBLE MINE #72, Pictures from Ground Zero: As you round the end of #LakeIliamna and enter the #Iliamna #river #valley, you have passed #PedroBay and a maize of #islands (upper portion of image). 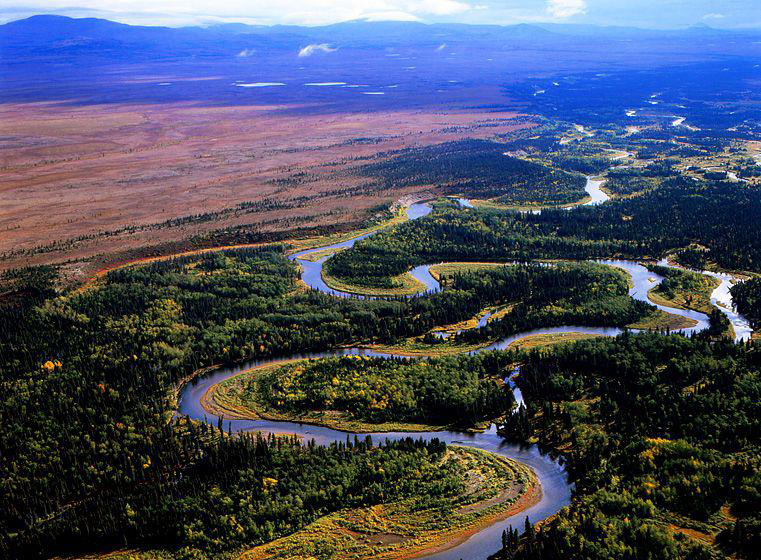 The sizeable Iliamna river then begins to wind its way deep into the #AlaskaRange. 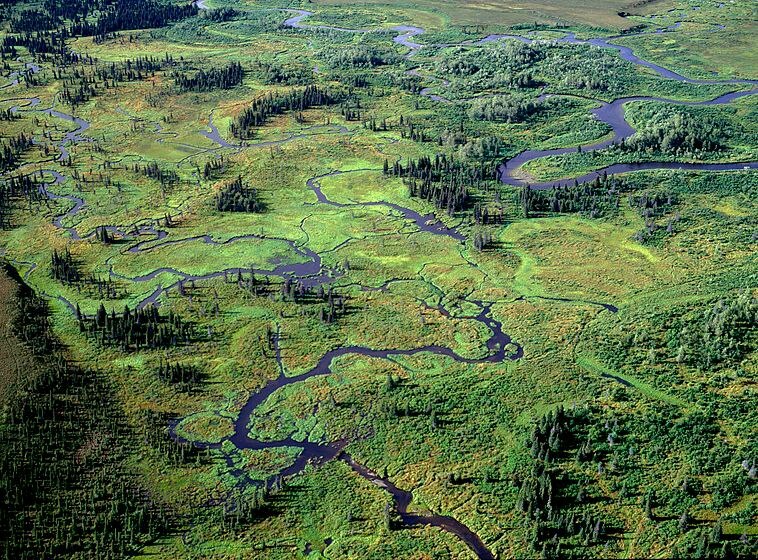 A spectacle of untouched meanders, meadows, and tributaries that feed the larger river, this #ecosystem would be forever altered by the haul-road for the proposed #PebbleMine and inevitably a number of #salmon stream tributaries to the Ilamna will be altered or obliterated by construction. As the valley narrows and the #mountains rise, #snow depth will be another issue that will likely make keeping such a #road open; dangerous, difficult and expensive. Of course, dozens of hauls-a-day and all that diesel/gas fume belched into this pristine #environment will not be beneficial to ANY part of this #habitat. NO PEBBLE MINE #70, Pictures from Ground Zero: Of course, big #weather can make working with #cameras more difficult. After years of being in the field in #Alaska, I have developed some truly ridiculous, but effective ways of keeping my equipment dry and functioning. Why? Because every once in awhile, the #storm breaks at just the right moment and you want to be ready. 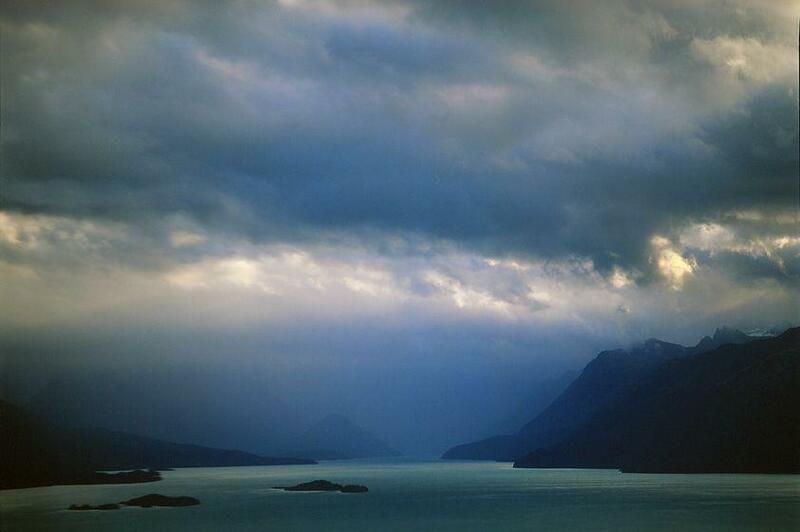 Before #Adobe, this is #transparency #film at its best and #LakeIliamna is putting on a show. A Native friend joked with me that the #salmon swim out of #BristolBay, up into the lake, just so they can see this. NO PEBBLE MINE #69, Pictures from Ground Zero: And then there are OTHER days!!! On this particular morning, I was in #Katmai National Park and expecting to get picked up by plane and flown north into #LakeClark National Park, inevitably crossing #LakeIliamna. At dawn, in camp at #Katmai, there was a rising wind out of the north and it was bringing #weather. #NaknekLake, where the pick-up was scheduled, was wide, open water facing north and in no time, wind fetch created 6-foot waves on the shoreline. Nonetheless, a radio message confirmed my pilot was on his way and I would meet him at another lakeshore with a protected cove. He arrived, we departed, and predictably the flight was rough, BUT one of the more amazing moments of the morning occurred over #Iliamna - flying directly into the extreme headwind which peaked as we approached the lake, a 10-15min crossing took the better part of an hour because the plane could barely move forward against the building storm. 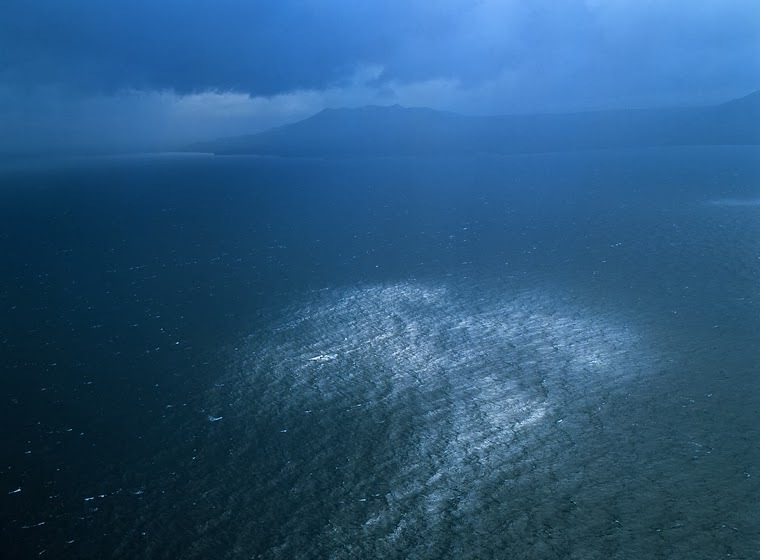 NO PEBBLE MINE #68, Pictures from Ground Zero: You take a lake as large as #Iliamna and position it at the foot of 12,000-17,000ft mountains, all of which face into the #BeringSea, and you will create some VERY interesting #weather. As I have previously mentioned in this blog, there is considerable year-round weather in the form of rain and snow, but sometimes none of that is happening. This is a 60-75mph blow, coming right at me and generating waves on the lake. A pilot friend of mine flipped his plane on an early morning takeoff when a wave clipped his float/pontoon. Down below, fishing? ...Wind chill is stunning! NO PEBBLE MINE #67, Pictures from Ground Zero: The #NewHalen river is certainly one of the most significant rivers flowing into #LakeIliamna because it comes out of the massive drainage of #LakeClark but MANY rivers feed #Iliamna. Water is everywhere. 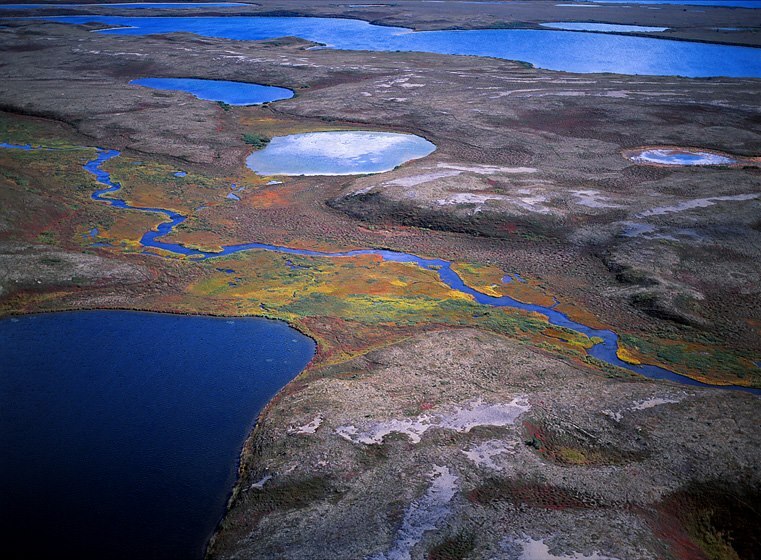 Along the more level shoreline of the lake, expanses of open #tundra are dotted with small lakes and ponds - hundreds of them, and through this maze, numerous smaller rivers feed into the lake. It is these smaller rivers that are the home-waters for the spawning #salmon, coming up the #Kvichak and into Iliamna from #BristolBay. 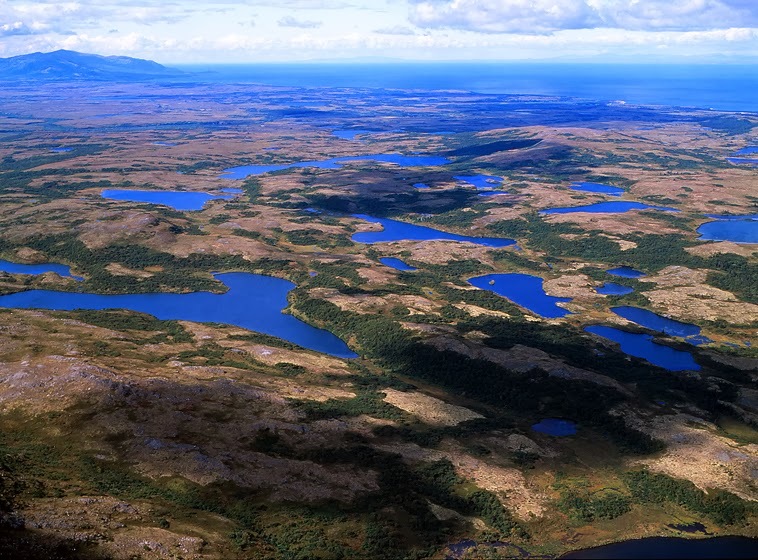 NO PEBBLE MINE #66, Pictures from Ground Zero: #Lake Iliamna is fed by some very large expanses of #headwater, which is why it is also so large. 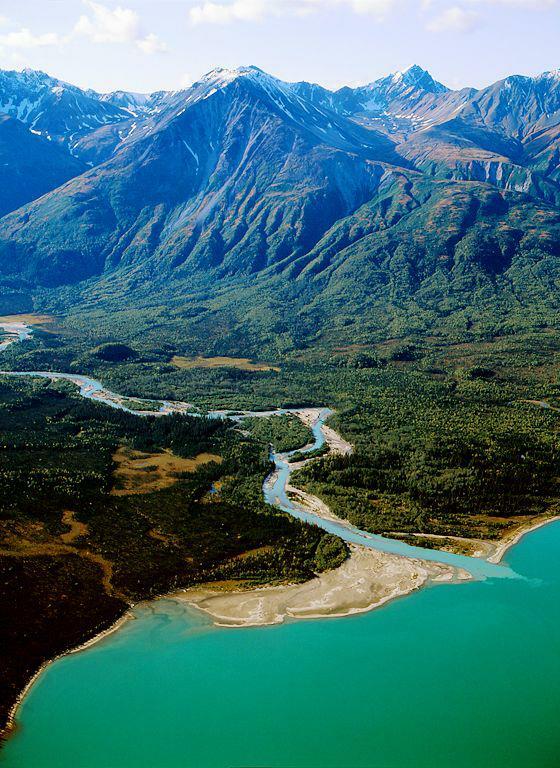 From the north, a substantial portion of the #LakeClark drainage is channeled through the #NewHalen river which connects Lake Clark to Lake Iliamna. The New Halen is a spectacle of whitewater; big whitewater. It is also a vital connection for spawning #salmon to the numerous lakes and rivers in #LakeClarkNationalPark. The haul road for the proposed #Pebble mine would follow a portion of the southern shore of Lake Clark, then bridge the New Halen and parallel it to the shoreline of Iliamna, before turning west. The integrity of habitat for both Lake Iliamna and the park will be inexorably altered by this kind of industrial activity. 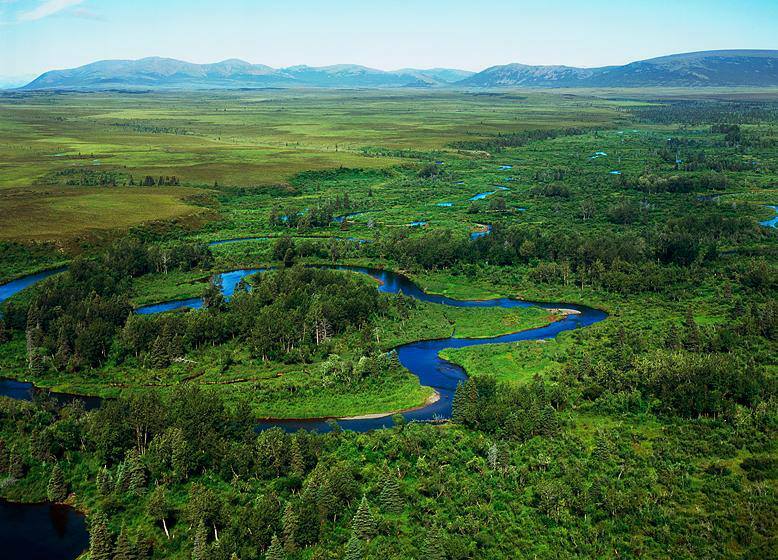 NO PEBBLE MINE #65, Pictures from Ground Zero: #LakeIliamna is the source of the #Kvichak river. #Iliamna is one of the largest #freshwater #lakes in the world stretching over 60-miles in length and 2-3 miles in width. 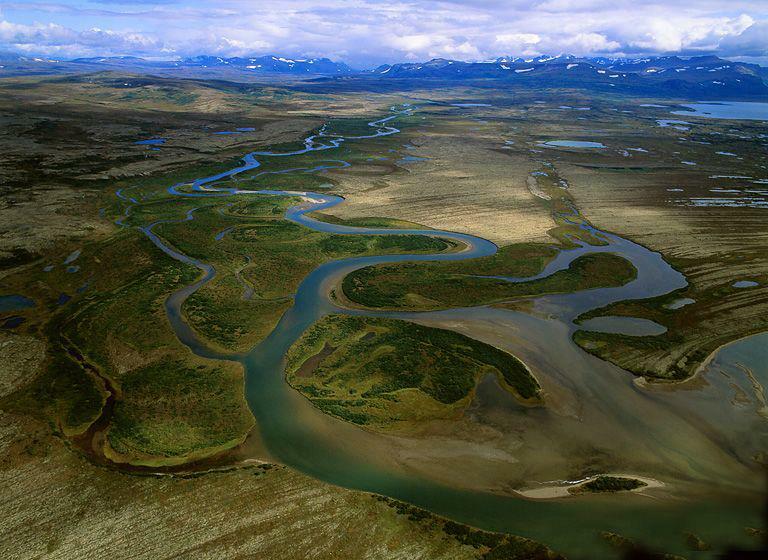 Rivers feed into Iliamna from its own headwater/valley connected to the deep heart of the #Alaska #Range, but also from #Katmai and #LakeClark National Parks and their vast mountain/river systems. Iliamna has numerous islands, great recreational opportunities, AND it supports a unique species of freshwater seal, similar, but not the same as those in #LakeBaikal (#Russia). 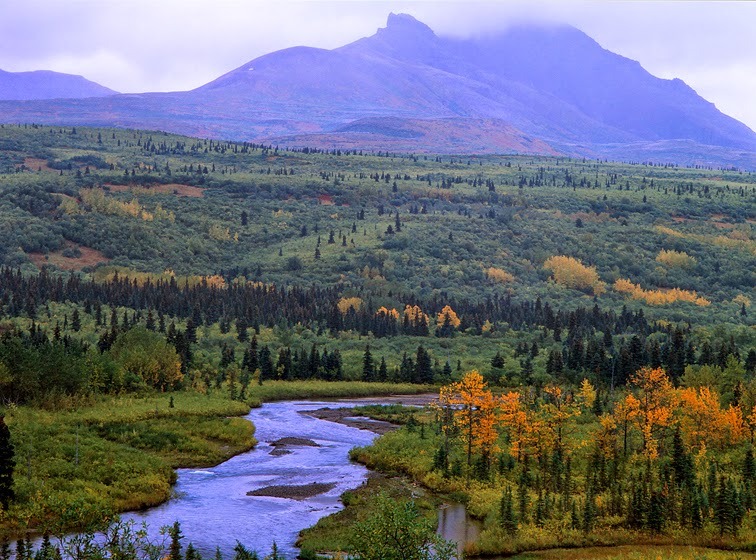 The mine-to-port haul road for the proposed #PebbleMine would be built along a substantial portion of the Iliamna shoreline, over MANY productive salmon streams, and through the Alaska Range, following the Iliamna river valley. REALLY... during the winter? LOL! 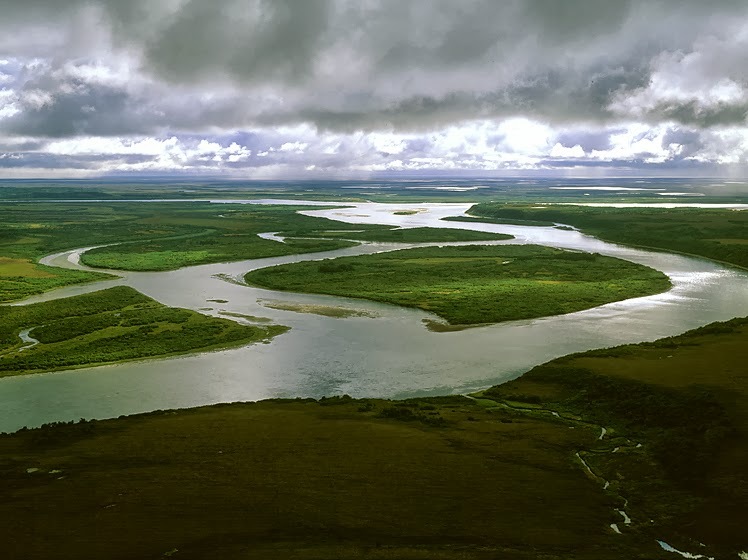 NO PEBBLE MINE #64, Pictures from Ground Zero: The #Kvichak connects #LakeIliamna to #BristolBay and although the #river is not great in length it IS a big river fed by many other large river systems. This is a particularly impressive section of the Kvichak is known as "#TheChannels" and if you look closely, at the top-middle of this image, you will see a substantial #inflow to the Kvichak from another drainage. 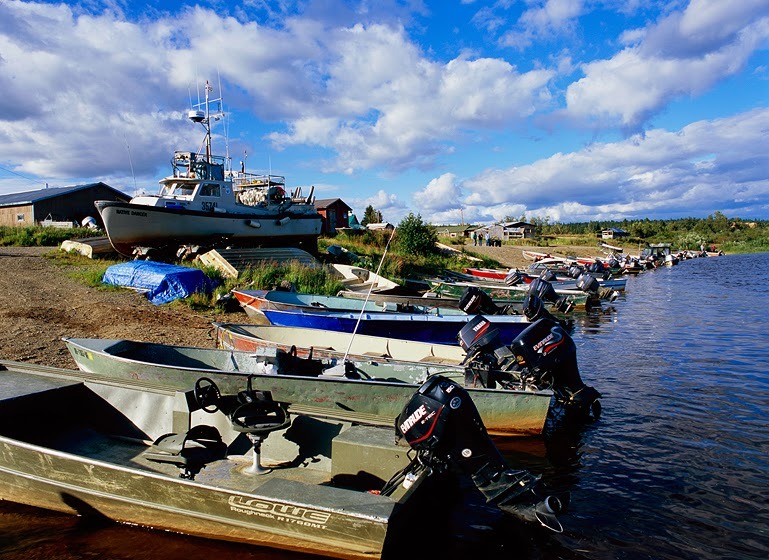 The Channels are an important destination for recreational fishermen, and also for the 6 #Native #villages that are located on the shore of the river. NO PEBBLE MINE #63, Pictures from Ground Zero: My/our journey has now taken us down the #Nushagak #river from the site of the proposed Pebble mine, all the way to the #Pacific and #BristolBay. 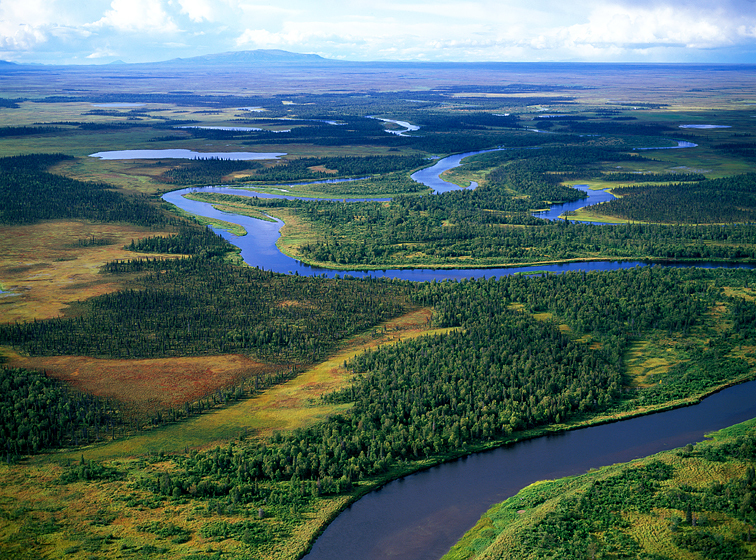 The Nushagak drainage, and the numerous related river systems that feed into it, is one of the two #headwaters MOST important to the commercial #salmon fishery in Bristol Bay. 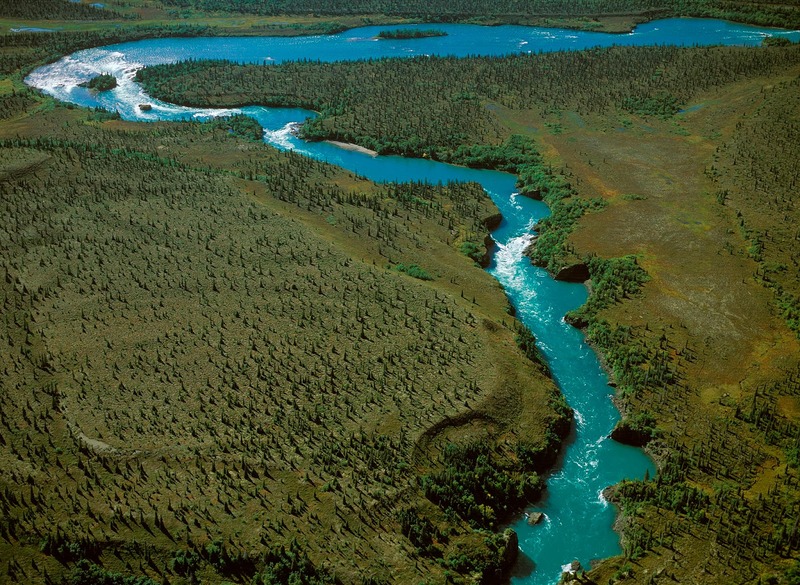 The other river, the #Kvichak, is shorter in length, but larger in size, as it collects water from #LakeClark, #LakeIliamna and #Katmai, a VAST headwater of tall mountains and significant snowfall. The only other "city" in #Southwest besides #Dillingham is #KingSalmon-Naknek located on the #Naknek river that feeds into the Kvichak. 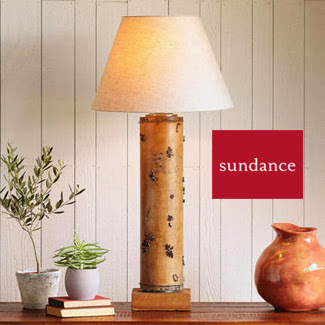 The double name reflects the commercial fishing town of #KingSalmon and the quite nearby Native village of #Naknek, located literally at the junction of the two rivers. EVERYBODY fishes ! I mean, seriously... King Salmon? NO PEBBLE MINE #62, Pictures from Ground Zero: #Dillingham, #Alaska sits at the mouth of the #Nushagak #river, one of the two most productive rivers in the #BristolBay #commercial #salmon #fishery. The town(s) of King Salmon-Nakek lie slightly further upriver on the #Kvichak, the other major river, but ALL face the fierce weather that rolls in off the bay and out of the #BeringSea. In the summer, constantly changing weather systems provide some dynamic skyshows, here a massive storm cell unleashes on the far shore of The #Nush. NO PEBBLE MINE #61, Pictures from Ground Zero: #Dillingham, #Alaska is a vital supply line for all the villages in #Southwest, and it is located near the mouth of the #Nushagak #river so that barges can offload supplies for residents and so the #fishing fleet can launch into the bay. Facing directly into #BristolBay and the #Pacific, Dillingham sees significant #weather most days of the year. 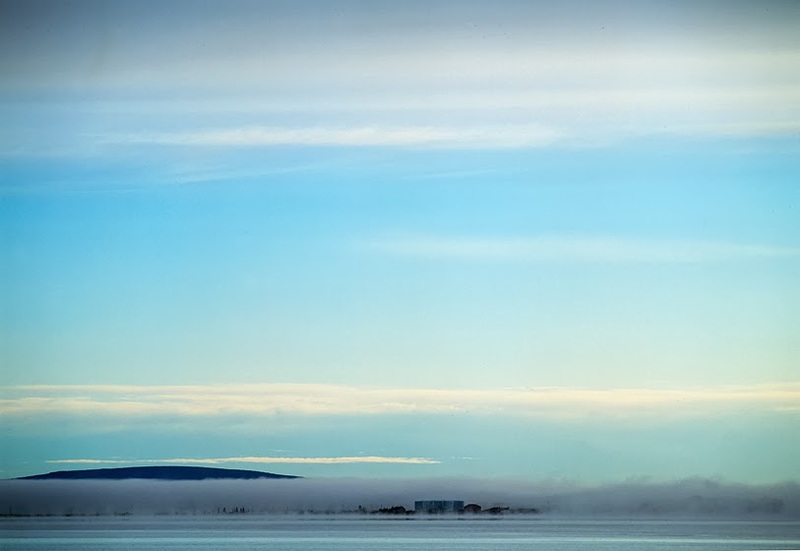 Here, on a cold, clear morning, Dillingham and its 5,000+ residents disappear into a bank of river #fog. NO PEBBLE MINE #60, Pictures from Ground Zero: The #Nushagak #river is big now, #BristolBay is close. One of the only towns in #Southwest, #Dillingham, is just ahead. At this point, the river is close enough to the reach of the #Pacific that it is affected by the tidal flux of the #bay. 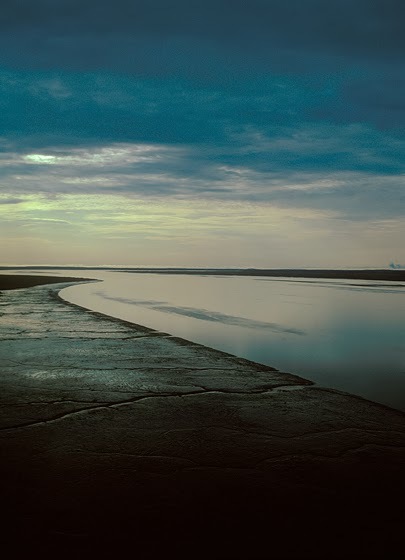 In the light of dawn you can see from the exposed mud flats along the #shoreline, as there is currently a low tide. AND, it looks like there is going to be some weather coming in. How unusual... LOL! NO PEBBLE MINE #59, Pictures from Ground Zero: Beginning with my work on the Hudson River, I have always shot “random” #panoramics of 2-3 frames that I exhibit as continuous. I say random because they are not measured out with perfect digital seams – nor do I care – it is the #idea / #view that matters, AND the #flow / #rhythm between the #pictures. Here for your enjoyment is a #twilight #diptych from the lower “Nush” after a day of big #weather. The lightshow went for hours in the long summer eve ! NO PEBBLE MINE #58, Pictures from Ground Zero: As our trip down the #Nushagak #River below the site of the proposed #PEBBLE #mine nears its mouth at #BristolBay, the river is wide and flowing with a lot of volume. The #horizon is relatively flat, while big #skies overhead roll in from the #BeringSea. The “Nush” may appear to be still, calm water, BUT it – and you - are moving at a good clip. In a slow-to-steer, heavily-laden float boat, a large #tree on the bank that has fallen into the river – a sweeper – could appear suddenly on a bend. Our LARGE boat could be crushed or sucked under it if we did not avoid it – not always a simple task. For scale, THAT is a sizeable tree floating thru the middle of this image. NO PEBBLE MINE #56 Pictures from Ground Zero: NO PEBBLE MINE #56, Pictures from Ground Zero: Many #Native villages in #Southwest #Alaska / #BristolBay are NOT connected to any road system. 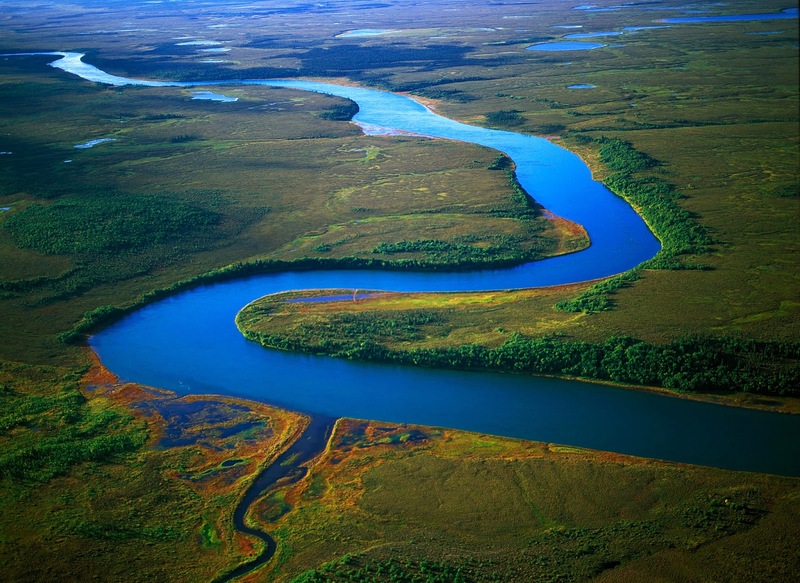 Located on #rivers, the #water is their highway. Many #villagers commercially #fish Bristol Bay, so some have larger vessels to do that job, but ALL villagers fish #salmon for their personal use, so when you arrive at a village, the shore is a busy place and it becomes clear how dependent these lives are on the presence of the river and the salmon. NO PEBBLE MINE #55, Pictures from Ground Zero: A “big” #river now by any description, the lower “Nush” draws closer to its mouth in #BristolBay and #villages begin to appear along its #shoreline. These are #Native villages, and for most #inhabitants of these #communities, #subsistence #hunting and #fishing puts the #food on their table. They live “off-of-the-land”, or in this case, off of the river and its many gifts. 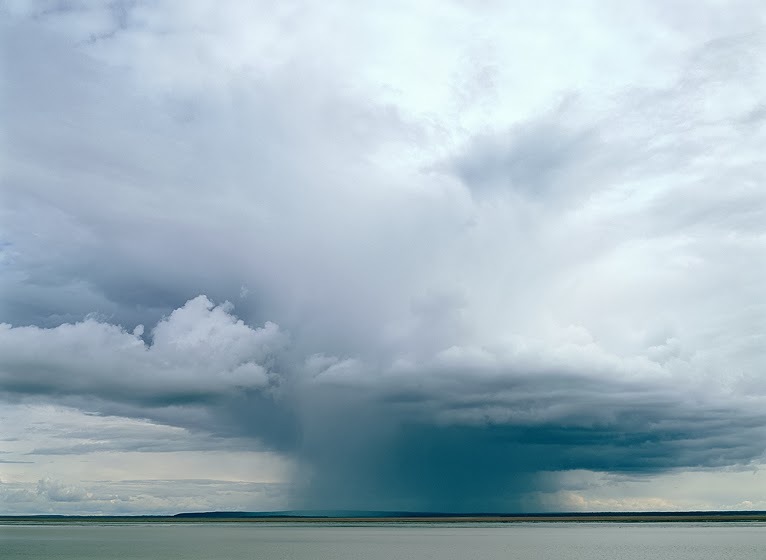 NO PEBBLE MINE #54, Pictures from Ground Zero: Big #weather off the #BeringSea streams into #BristolBay and out over the #landscape of #Southwest feeding the #river systems that make up the #headwaters of one of the greatest #fisheries in the world. Here the #Nushagak - 1 of the 2 most productive rivers in the #fishery – broadens and grows in volume as it heads towards Bristol Bay - to the right in the distance. NO PEBBLE MINE #53, Pictures from Ground Zero: As the hills that define the proposed PEBBLE mine site recede further into the distance, the downslope waters continue to merge into the Nushagak river drainage. Ever bigger, ever more volume, the Nushagak continues to grow. As U can see in this image, we r so far downslope now, EVEN THE FEEDER systems are sizeable rivers unto themselves. NO PEBBLE MINE #52, Pictures from Ground Zero: My #images have been taking us #downstream, below the site of the #proposed #PEBBLE #mine, describing how small #streams are collectively feeding into the #Nushagak, one of the two most important #rivers in the #BristolBay #fishery. In the distance are the #hills near the proposed mine site. Think of how much #water is coursing thru this #landscape based on what I have shown you! ...and we are only ½ way to the #Pacific. 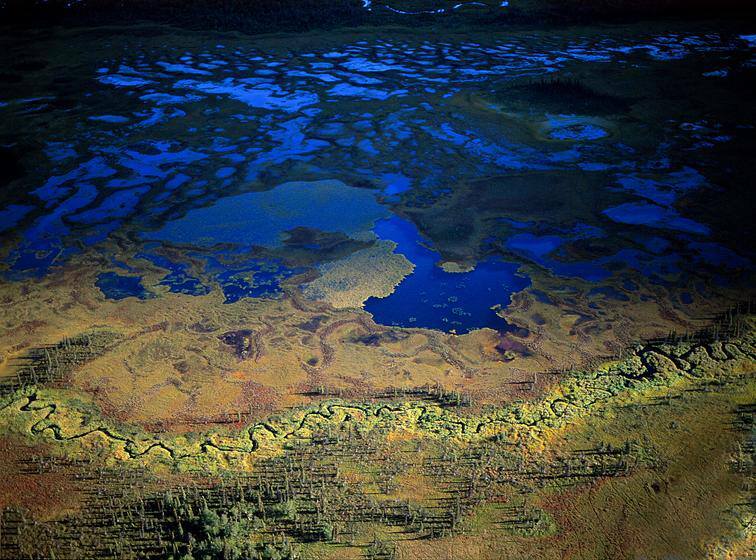 NO PEBBLE MINE #51, Pictures from Ground Zero: Not all water flows flat and blue. As many small #tributaries feed into the larger drainages of the #BristolBay #watershed, sizeable #rivers are created. Most meander lazily down thru subtle valleys in the rolling #tundra hills, but occasionally more rugged features in the landscape create some pretty impressive #whitewater. For scale, middle-top of this image there are several float boats on the #beach of a quiet-water #eddy in the river. Spawning #salmon are very determined and will swim thru this to get further upstream. Hey, @Ray Troll, "spawn 'till you die", right? NO PEBBLE MINE #50, Pictures from Ground Zero: As the #salmon swim up into the ever smaller #rivers and #streams of the #BristolBay watershed, the WATER is headed the other way and those small streams are now collecting into sizeable rivers. Peaceful in appearance, water volume and rate of flow on a big river is significant and at flood stage it regularly changes its course as indicated by the patterns of the growing trees. 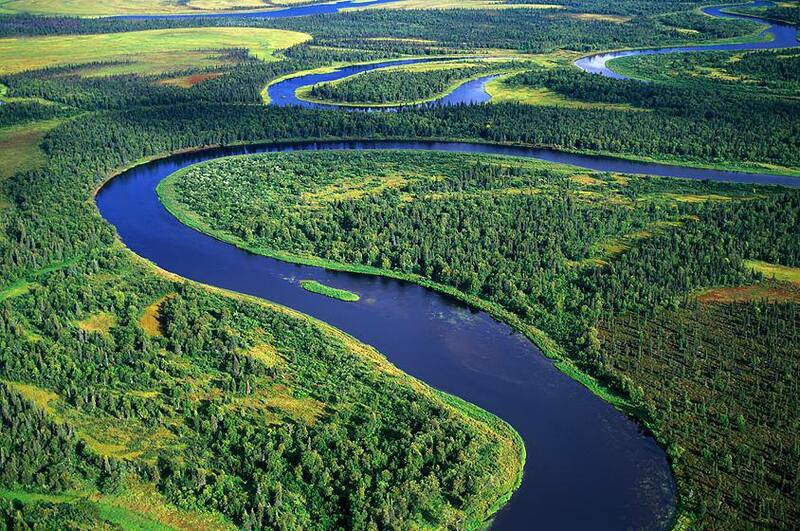 In the center near the top of the frame, an oxbow "lake" has been created because the ever-shifting river cut that meander off. Once "home", female #salmon lay their eggs on gravel bars which the males swim across and "milt". Look carefully, though, someone else is also interested in those eggs. Hovering just above the eggs and just below the salmon is a #rainbow #trout nearly as large as the salmon. This is a trophy fish, grown huge from gorging on salmon eggs, and sought after by hi-end #fishermen from all over the world. These trout are #catch-and-release only, and the experience of pursuing them in a wild #Alaskan river contributes about $10-15million to the southwest economy. 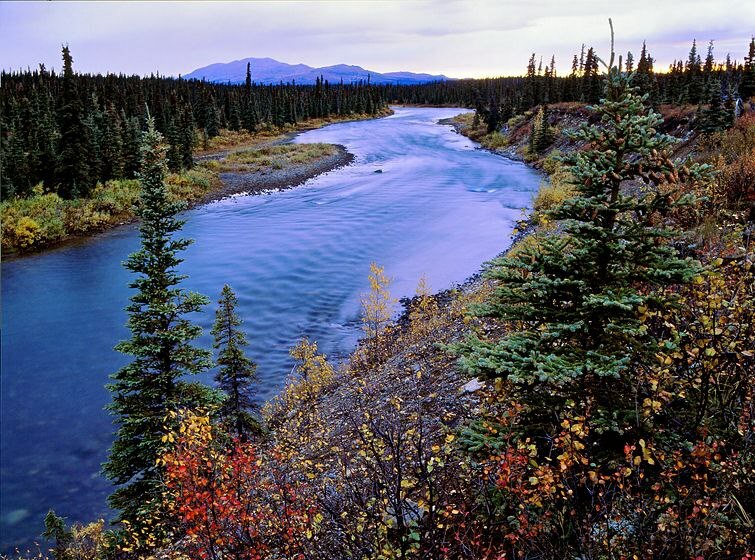 The waters of #Southwest #Alaska are THE MOST DIVERSE FRESHWATER HABITAT in North America. Say NO to the PEBBLE MINE - there is no place for it here. When the #salmon come out of the #Pacific and begin to collect in #BristolBay, you can see them from the air shimmering in clusters in the water below. BUT in the immensity of the bay it is hard to realize how many fish you are looking at. 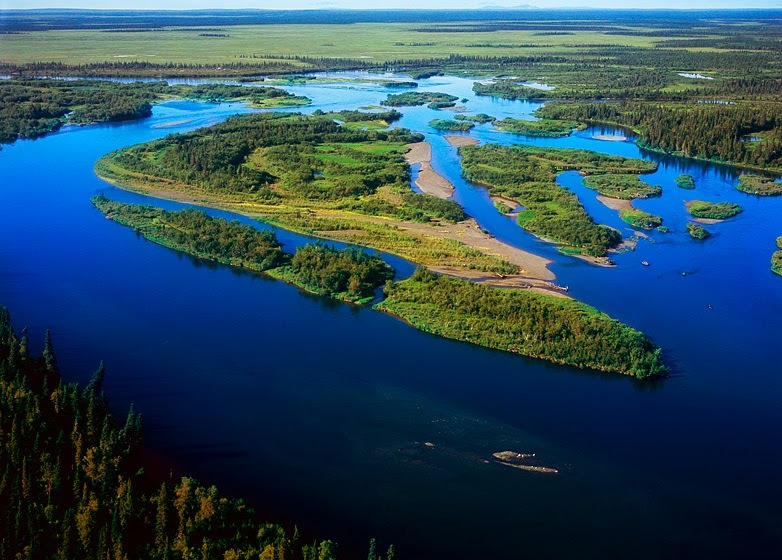 Once they start up the #Nushagak and #Kvichak rivers, their density increases as the waterways narrow. 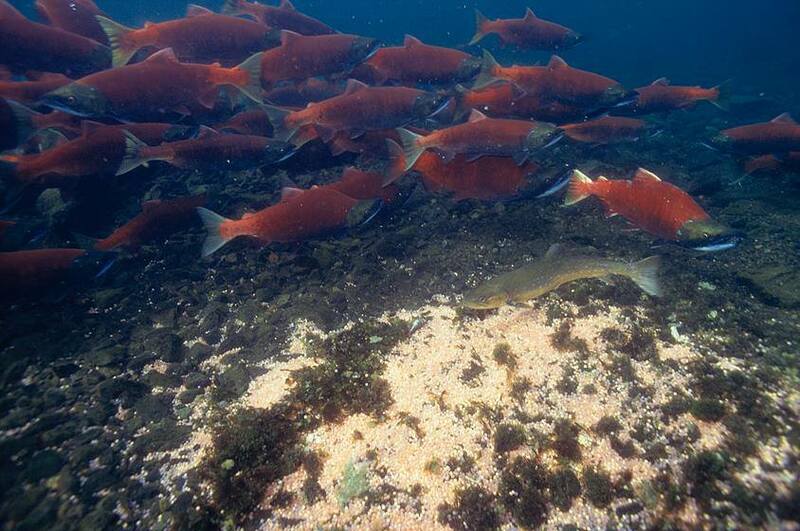 When the salmon leave the main system for the smaller tributaries where they will spawn, it is quite a crowded stream. I would like to thank friend/photographer #GregSyverson who took these pictures for one of my books. Greg thought it would be interesting to don a drysuit and with a waterproof camera, float downstream thru the fish traffic migrating in the other direction. As we are traveling #downstream below the proposed PEBBLE mine site, we are witnessing endless #streams feed into small #river #valleys which in turn merge into the ever-larger system of the #Nushagak #river. 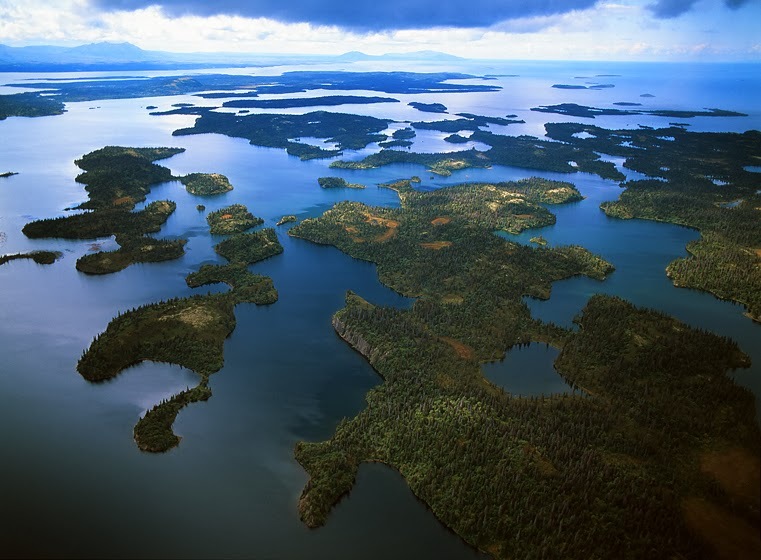 Beneath these waters, one of the greatest #salmon #migrations on earth is headed upstream. Coming out of the #Pacific, the salmon enter #BristolBay and the largest numbers of fish go up the #Kvichak and #Nushagak, two of the largest rivers. 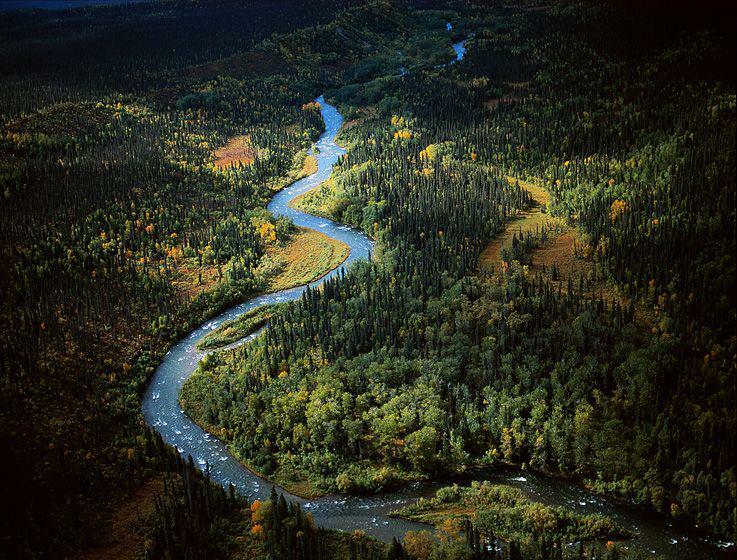 These rivers are too large and flow too fast, however, for the salmon to #spawn. The fish are headed for THESE waters (pictureed here), slower - quieter - meandering - and with plenty of #sandbars where they can lay their eggs. My visual journey is taking us #downriver from the proposed Pebble #mine site. We are following many, many #streams as they collect into the #Nushagak river, one of the two larger rivers most vital to the #BristolBay #salmon #fishery. 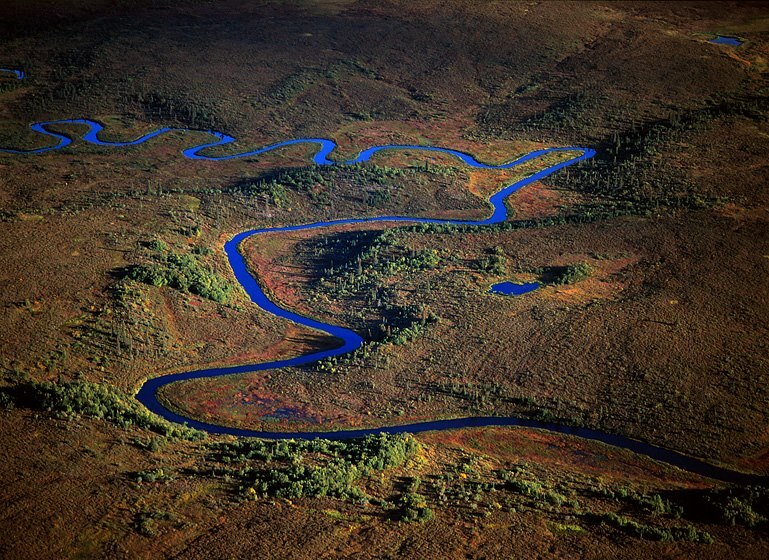 Some "feeder" #streams occupy substantial #valleys, others are like small squiggles as they meander over the #landscape. As I have said before in these posts, the larger aerial view always astounds me and in this shot, I see the very fabric of existence of life on Earth. 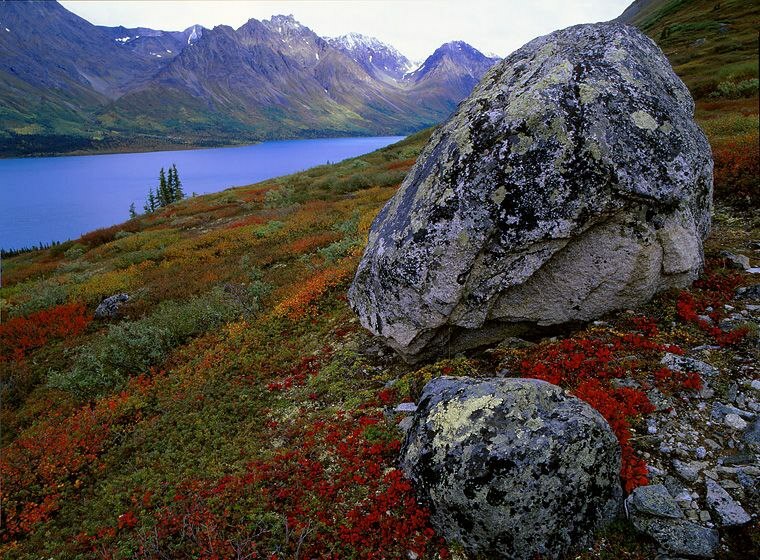 The PEBBLE MINE will alter this environment FOREVER -- SAY NO TO THE PEBBLE MINE! 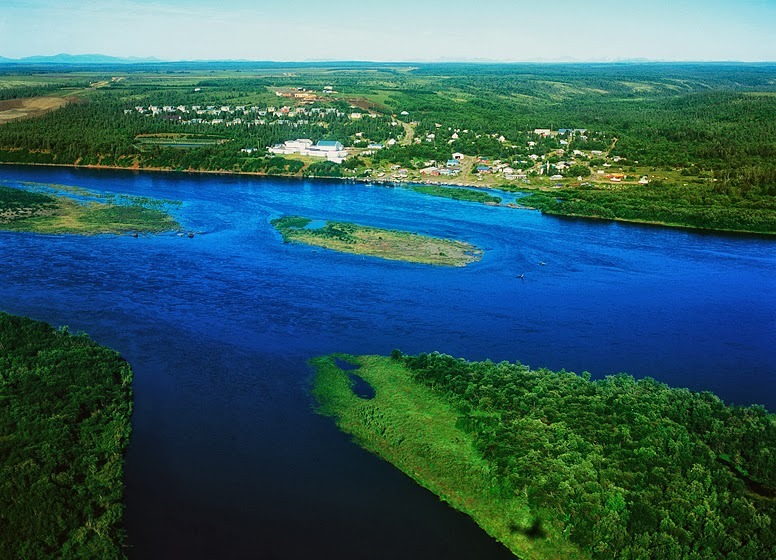 As the waters collect from the #tributary #streams BELOW the proposed Pebble #mine site, they will eventually coalesce into the #Nushagak #river, one of the two principal rivers that support the world's most productive #salmon #fishery, #BristolBay. 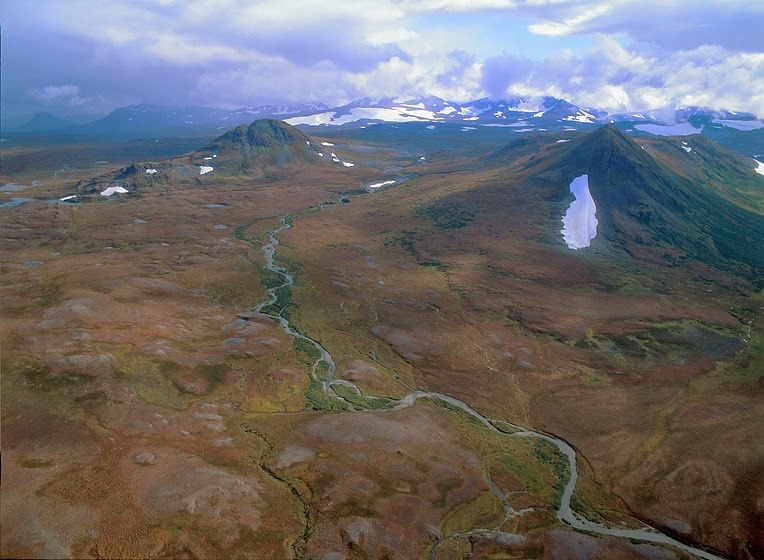 Initially the "joined" waters meander erratically down lush, swampy #valleys thru the rolling #tundra #landscape. But, as the water descends, hundreds of "arms" in this #aqueous spiderweb create ever-larger drainages that are substantial river systems in and of themselves - #Mulchatna, #Chilikadrotna, #Koktuli, and #Stuyahok. 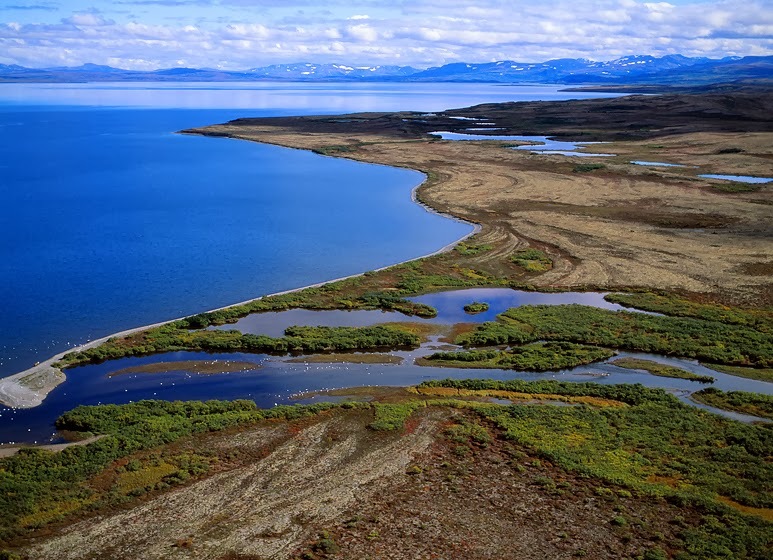 The #water-saturated #headwaters of the #BristolBay #fishery will begin to drain into the #open-pit of the proposed PEBBLE mine as soon as ground is broken. As I showed in previous post #42 of the #BerkleyPit in #Montana, the downflow of water creates significant #erosion #channels in the walls of the pit. Were the PEBBLE to be constructed, the erosion would be constant and massive, coming from surface water, large amounts of #rainfall, and significant #snowmelt. In the MUCH DRYER environment of #Utah, this catastrophic slide is what recently happened at the #BinghamCanyon open-pit mine. And, if this might happen to the pit walls of the PEBBLE, how about those nearby earthen dams larger than #ThreeRiversGorgeDam complex in #China that are expected to "contain" the 20-square-miles - literally a #sea - of #toxic #iron-acidic, #cyanide-laced water... are they eroding away as well? 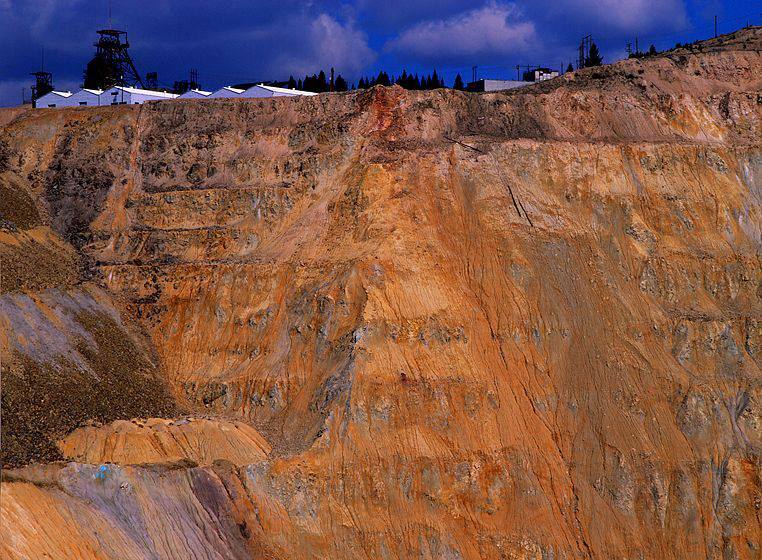 If you will recall, I diverged on my #downriver trip from the proposed #open-pit Pebble mine site in #Southwest #Alaska to explain a bit about #open-pit #mining, citing the #BerkleyPit #mine in #Butte, Montana. Clearly one of the issues with ANY open-pit mine is pumping the inflowing #groundwater and #toxic stew out of the mine pit and into "containment" lakes (you hope). 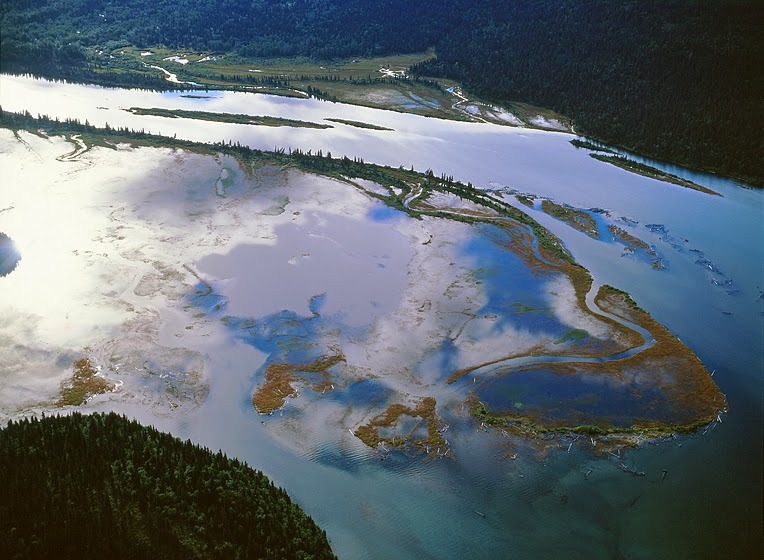 Historically, most open-pit mines have #containment problems, and in an area with this much surface water directly below the mine site, ANY spill would flow immediately into the #headwaters of some of the most productive #river systems in the #BristolBay #salmon #fishery. So, a #lake, somewhere, is being created from the pumping of the #toxic stew out of the #open-pit #mine to keep the mine from flooding. However, #groundwater is always leaking in, as is the #rain, so the pumping-out and lake-making must continue in PERPETUITY. At the #BerkeleyPit in #Butte, #Montana, the water table the mine eventually breached was subterranean, unfortunately at the site of the proposed PEBBLE MINE, the water table is virtually at the surface, water will flow into the pit from the 1st shovel they dig, and then it will rain, snow and melt out ON TOP OF THAT- note the water #erosion ravines on the side of the Berkley pit - NO PEBBLE MINE. 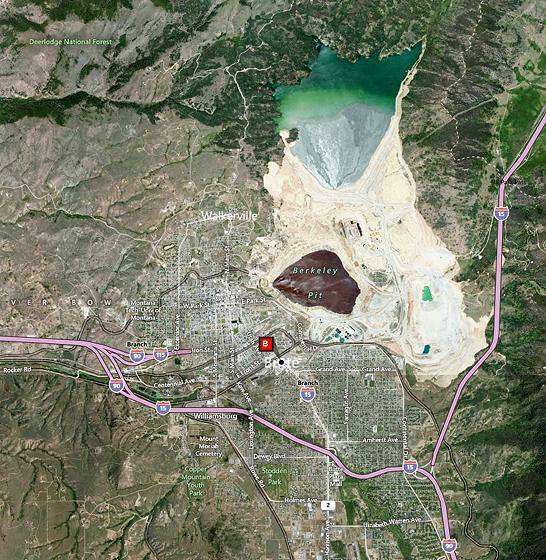 At ground level, that "lake" being created from the water pumped out of the #Berkley #open-pit #mine does not look like a good place to #fish -- or #swim-- and certainly NOT to #drink. What keeps these #toxins from seeping back into the #aquifer? Isn't moving this stew of #poison from one place to another really just a house-of-cards? 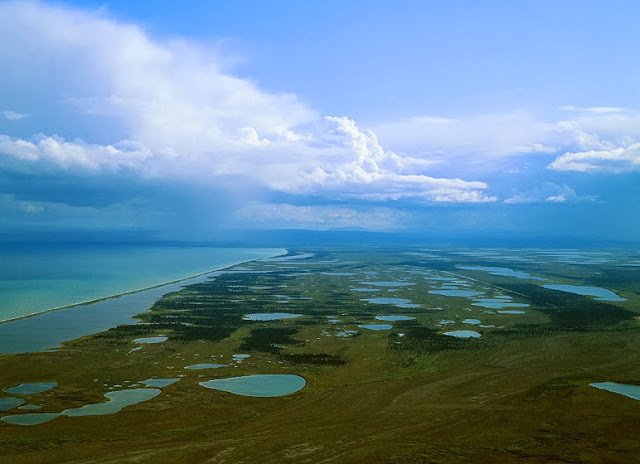 Imagine the scale of the Pebble mine "lagoons": 20-square-miles, and because of the #cyanide the lagoons will ALWAYS be toxic and must be MAINTAINED IN PERPETUITY. 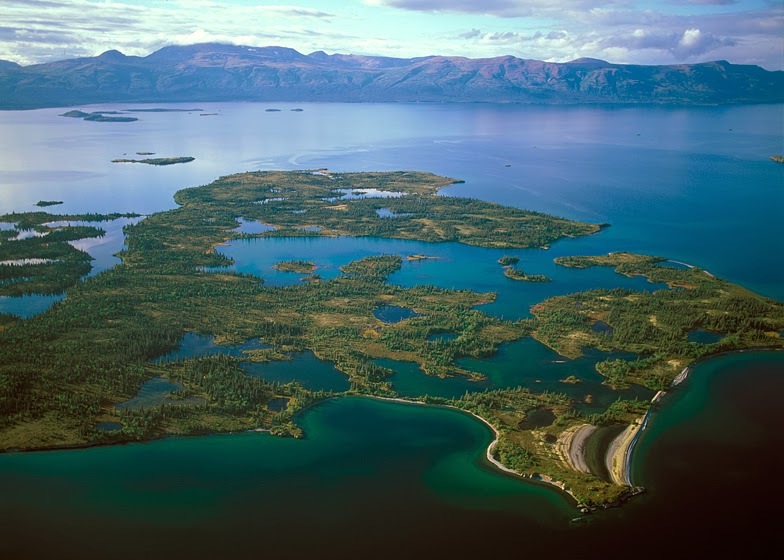 #Southwest #Alaska is a significant resting/feeding stop during #bird migrations up and down the #Pacific #flyway, hosting hundreds of thousands of birds and dozens of species... what will they think these lagoons are? Say NO TO THE PEBBLE MINE!!! 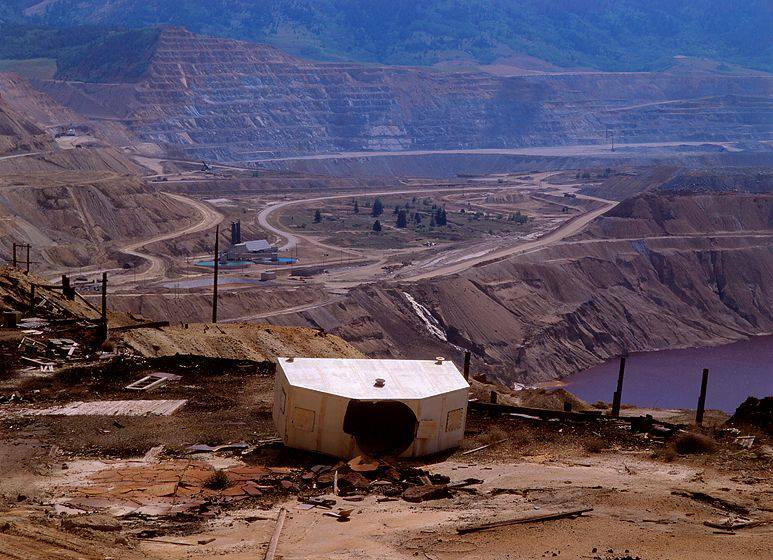 The #BerkleyPit in #Butte, #Montana is about 1,000-feet deep, but as it went down it dug below the water table of the valley so water began to flow in. 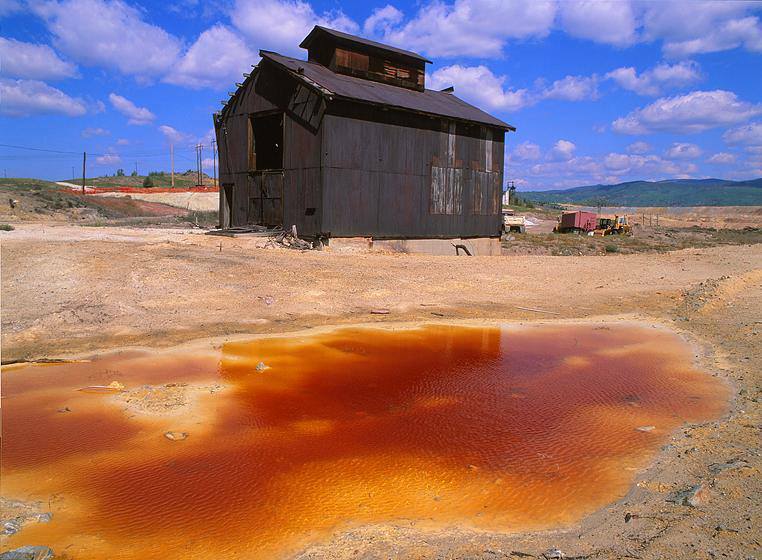 Rain and melting snow carry #chemical #pollutants from the ground site into the pit as well, and as the water in the pit interacts with #iron from the #mining process, it #acidifies, turning the reddish color seen here. 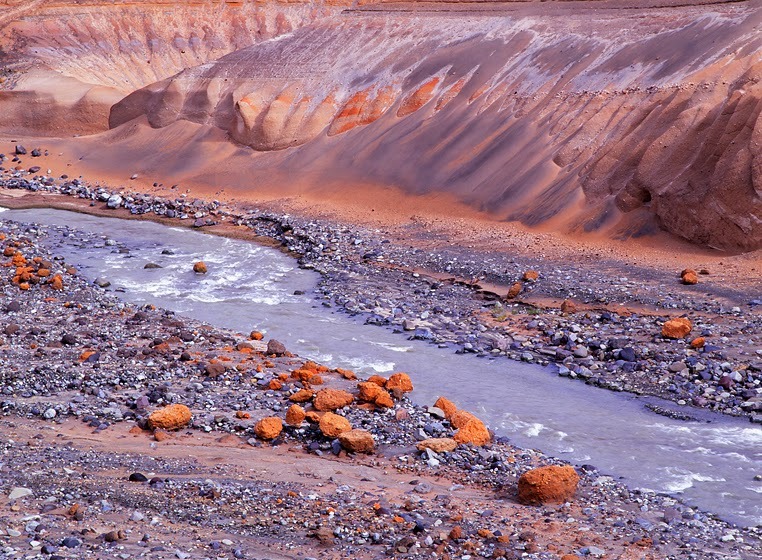 THIS WATER IS SO #TOXIC THAT NOW THEY ARE ACTUALLY MINING THE #WATER! The mine must also pump water out of the pit 24/7/365 FOREVER to keep the toxic water from rising to the point that it would flow back into the #groundwater #aquifer of Butte and the entire #river valley. BUT, where are they pumping it...? Major #petrochemical accumulation is showing up in the small #fish that constitute the 1st tier of the #foodchain in the #GulfOfMexico, a result of the @BP #oil fire / spill. As bigger #fish eat them, the #toxins accumulate in the bigger fish in increasingly larger concentrations. 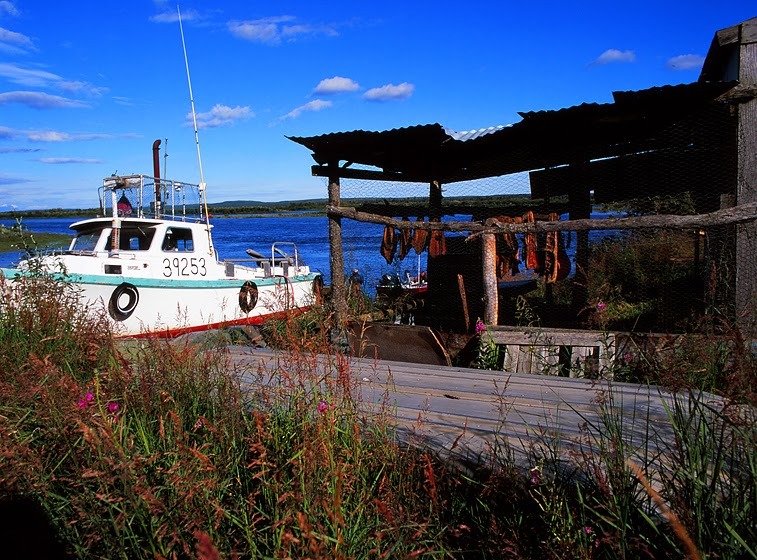 #BristolBay, #Alaska is the last major #CLEAN #fishery left in America. A new study by the #UniversityOfAlaska (@UA_System) places an ANNUAL #economic #value on the fishery of 1-1/2 BILLION dollars! How could anyone, even a politician, think putting a #cyanide-leach, #open-pit #mine in the #headwaters of this fishery is a good idea? Wake up America, you can't eat #gold and #copper - SAY NO TO THE PEBBLE MINE, keep Alaskan #salmon 'doin the CLEAN wild thing! As the mine ages, some buildings and equipment are #abandoned on site. Accumulating discarded industrial equipment often #leaks #petrochemicals furthering the #poisoning of the ground. Here #rainwater has collected in a pool, now #acidic because of #iron #oxides, BUT given the presence of the structure and trucks now sitting in disuse, other #hazardous #chemistry is surely in this pool as well. Eventually it will percolate into the #groundwater. 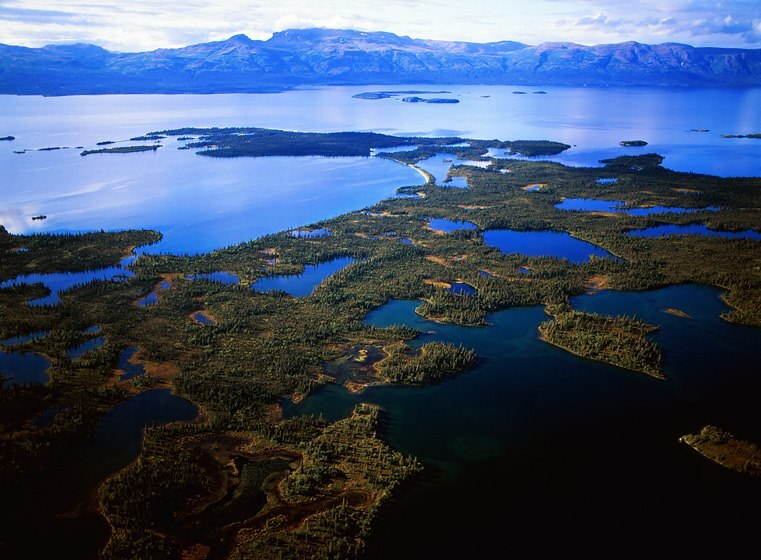 A valued #fishery is NO place for a mine like this, SAY NO TO THE PEBBLE MINE! The previous 5 images in this folio circumnavigate the proposed sight of the Pebble mine from the air. Should the Pebble be allowed, this is how the #landscape will be transformed - 1st a substantive community of buildings and roads must be created to support such a massive dig in such a remote place. Then the extraction of the #earth begins with #explosives used to pulverize the rock / dirt so it can be scooped up, trucked off and processed. 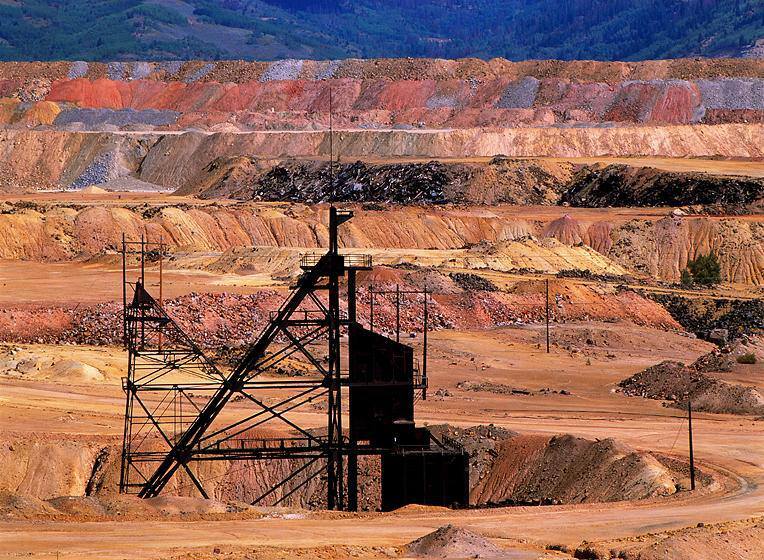 This is the #BerkleyPit in #Butte, #Montana - the color of the exposed dirt is the result of #iron #oxides formed as the soil is exposed to water and air - in a liquid form these iron oxides are HIGHLY #acidic. At the flight angle of the 4 previous pictures you do not fully perceive the amount of #water on the #landscape. Larger #rivers and #lakes are visible in those shots, but only from directly above can you finally see the spiderweb of smaller streams and #wetlands that feed into the ever-larger river systems. An "accidental" spill of a liquid #toxin in this habitat would spread EVERYWHERE! Say NO to the Pebble Mine! As the line of flight / sight travel moves away from the "hills", the #river #valleys are less defined, and the #landscape starts to flatten out into massive gently rolling swells. Even so, #water flows into every depression. Small #streams meander across the landscape, collecting into ever larger #rivers headed toward the #Pacific. In this image, I can see 6-7 feeder streams coming into the larger, foreground river. 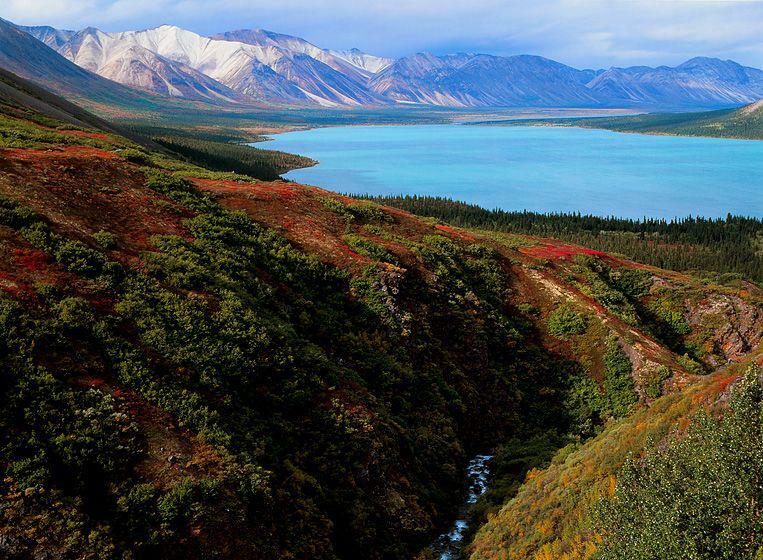 The Pebble mine would be at the far horizon; those hills will likely be gone, replaced by a 2,000-foot deep hole in the ground. 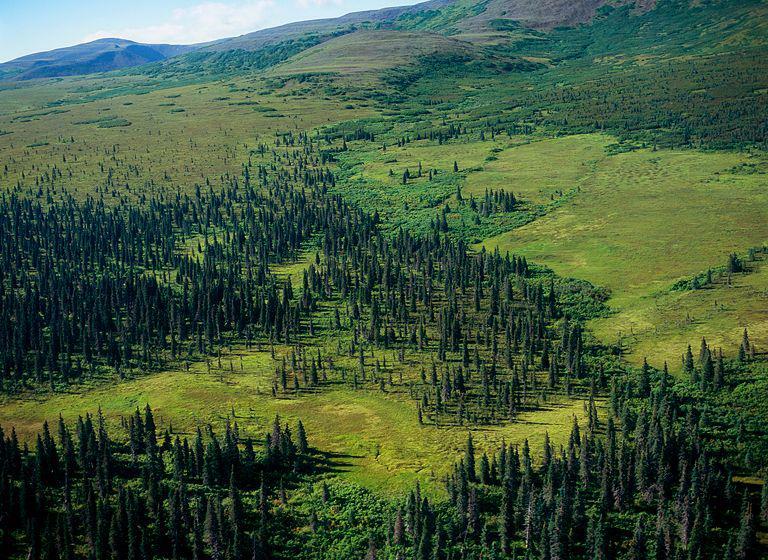 As the #tundra #vegetation channels the #rainfall into gullies, those small #streams collect into ever larger #rivers that wind their way through the broad rolls of the #landscape, connecting #lakes and #ponds. 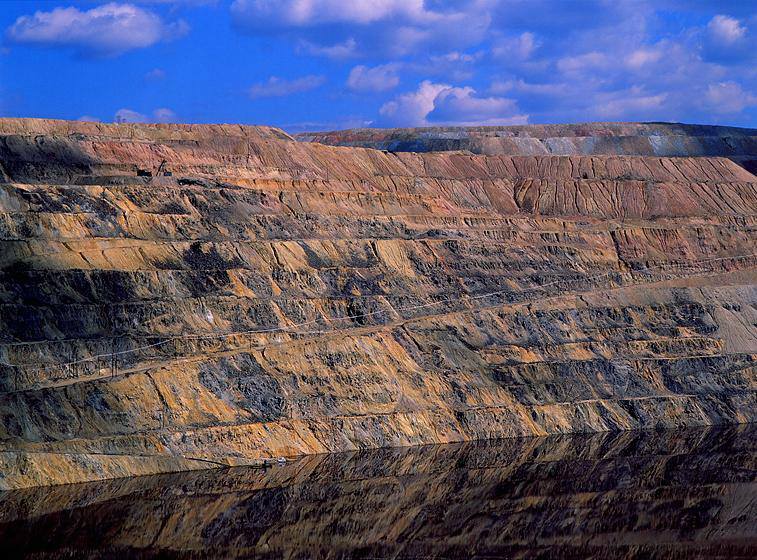 It is going to take a lot of surface disruption of this landscape, stream diversion, and electric energy production to perpetually pump groundwater from the 2,000-foot deep #pit of the Pebble Mine to keep it from flooding in a #toxic stew. If you flew towards what appear to be small hills in the distance of my last post (FB post #30) - effectively flying across what might become the 2,000-foot deep, #open-pit of the Pebble Mine - the scale of the #landscape that will be altered by the #mine becomes more apparent. The hills are NOT small and because of #rainfall off the #BeringSea captured by the #tundra, #streams flow down every crack and gully virtually year-round (4 or 5 are visible in this picture alone). When discussing the Pebble Mine, you regularly read / hear the terms "footprint" and "downstream" - so let's take a look at the #footprint and follow the #water #downstream. This is the #landscape where the footprint will be most visible - were the Pebble to be constructed THIS would be a 2,000-foot deep hole in the ground AND over 2-miles across, rim-to-rim. 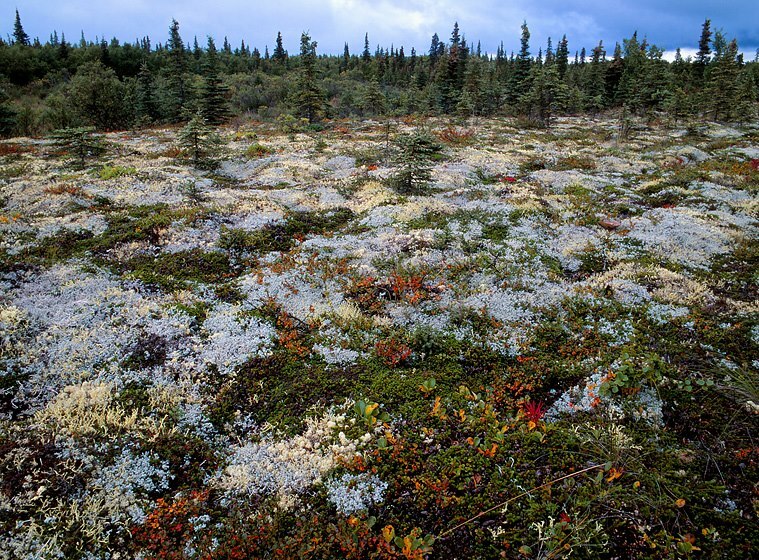 Beneath the carpet of #tundra and stunted #spruce lies a #water system as complex and intermixed as the vegetation it supports. 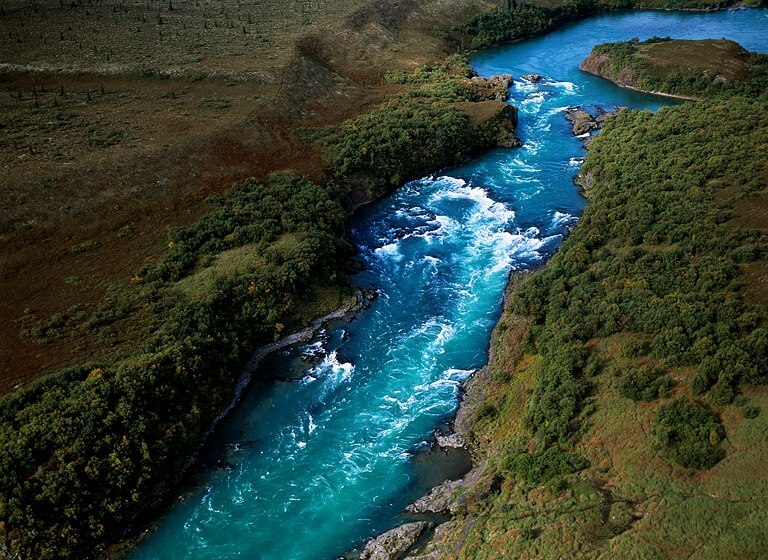 #Rivers not only wind through the landscape connecting #lakes to the #Pacific, but in some places they intermingle BENEATH the surface, flowing through porous rock from one drainage into another. #Cyanide #slurry or #iron #acids released into this environment "by accident" from the PEBBLE MINE would #poison everything. 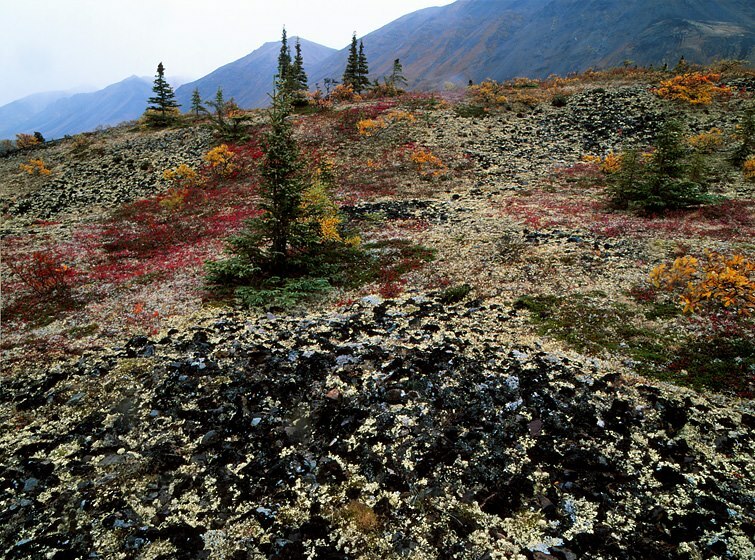 This is #tundra - a complex, stunted world of intermixed systems and species that covers most of the #terrain that will be imprinted by the Pebble mine. 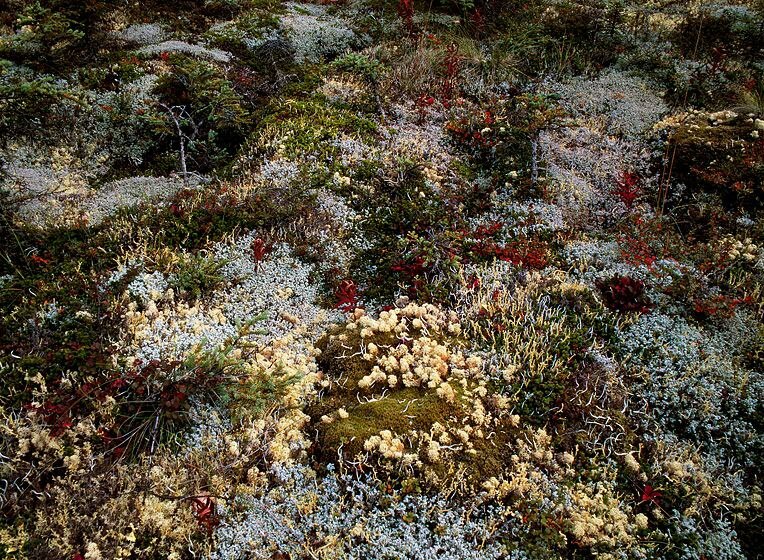 It is also a #microcosm of the larger, even more complex SYSTEMS the Pebble mine will impact. These #plants, the #animals, the #fish, the #water resource, the #air quality, some of America's most beautiful #parks, and OUR #publichealth will all be compromised - SAY NO TO THE PEBBLE MINE! Besides the impact of the actual #mine site, the system of roads and their industrial #pollution will also affect #LakeIliamna and beyond. This is the #IliamnaRiver above Lake Iliamna. The road from the mine to the shipping port will traverse this #river and #valley, disrupting it and all of its #tributaries. Try keeping the road open in winter! One morning, on a walk up the #Talarik Creek drainage the #water was teeming with #fish. I encountered 3 #grizzlies (at different times, fortunately! ), a #moose, several #eagles and 10 or so #recreational #fishermen. I also saw #caribou tracks and #wolf prints. 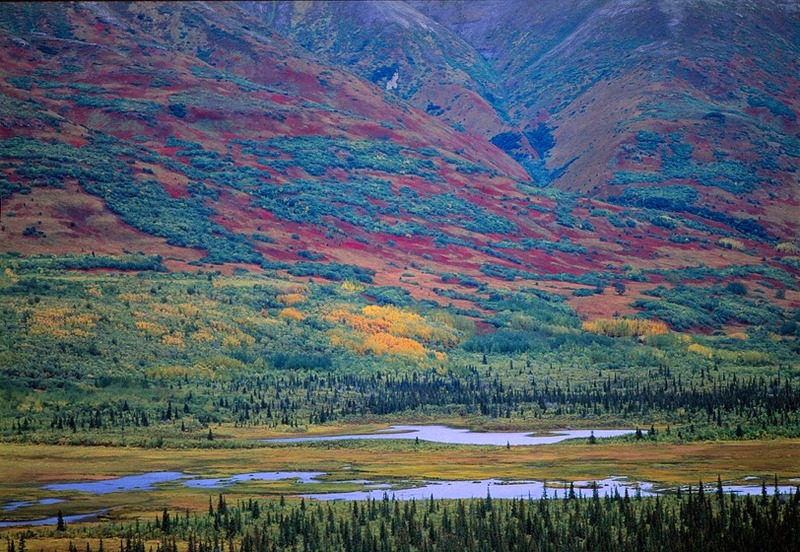 Why trade this vibrant #habitat for a #toxic hole in-the-ground called The Pebble Mine? Considered to be some of the world's finest #flyfishing, #Talarik Creek's vibrant path flows across the bottom of this photograph. In the distance is #LakeIliamna, one of the world's largest #freshwater lakes, and home to a unique species of #seal. 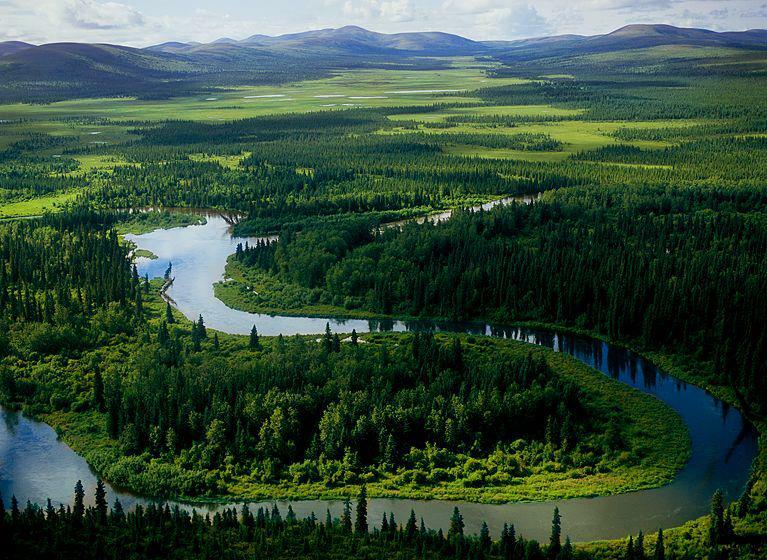 This whole #habitat is part of a multi million $$ American #fishery, and one of our wildest, most pristine national #parks, WHY PUT THE EXTREMELY #TOXIC PEBBLE MINE IN THE MIDDLE OF THIS? In a stunningly visual overlay of geologic time in #Southwest #Alaska / #BristolBay, #rivers and #lakes that support the current #fishery sit atop massive #glacial #striations in the rock. Disrupting all of this with the largest #mining complex on earth, staggering volumes of #toxic #debris, and miles of industrial roads is just wrong - SAY NO TO THE PEBBLE MINE! Low tide at the mouth of the #Kvichak river reveals " #DeadmanSands ". Out beyond the bar lies one of the greatest #fisheries left in the world, #BristolBay - an American fishery, a #clean #food #resource for American people, and a provider of thousands of American jobs. Why would we allow a #Canadian #mining company funded by a #British #investment firm to build The Pebble mine here and compromise this resource? 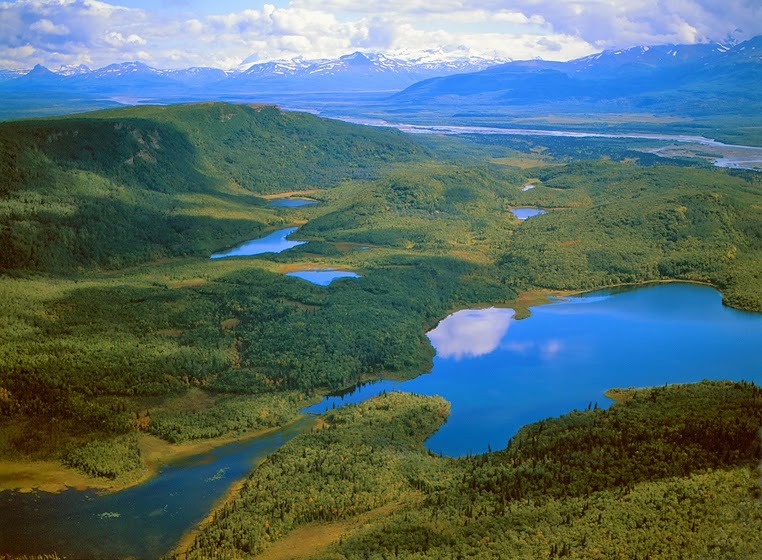 Because of litigation over the shortcomings of their 1st plan, the #Alaska Department of Natural Resources (@DNR) was directed to revise and reconsider. The new DNR plan just released has good points but insults #native communities by not recognizing #subsistence #hunting. There should also be greater consideration of #moose / #caribou winter #habitat, and ALL #STREAMS ARE HABITAT, navigable or not! There is NO WAY you can put the largest #open-pit #mine in the world and its 20 square-miles of #poisonous #lagoons in the middle of this fish-rich, water world and not impact the #habitat and the #fish significantly. Aside from the mine's #toxicity, there will be #coal burned for electricity altering #air-quality, and roads built that will impact dozens of #rivers and #lakes with their construction and industrial traffic. 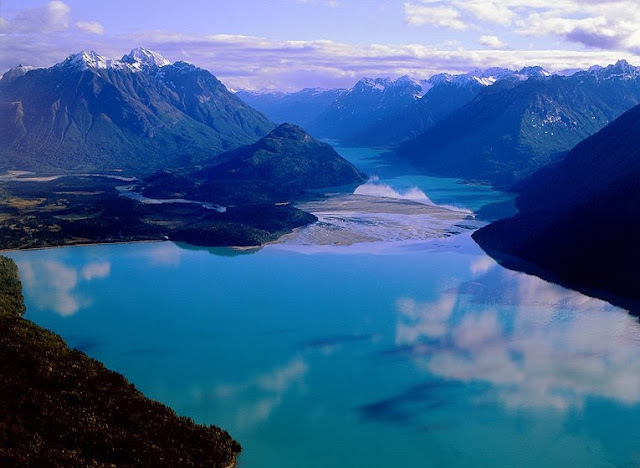 The #habitat of #Southwest #Alaska supports the most productive #salmon fishery in the world, but there is also #arctic #char, #dolly #varden, and huge #rainbow #trout in abundance, not to mention all the other #animals, #birds, and epic American parkland. President @BarackObama has my books to ensure that he and his family can SEE what is at stake. Contact him now, tell him to support the @EPA and direct them to say NO TO THE PEBBLE MINE. 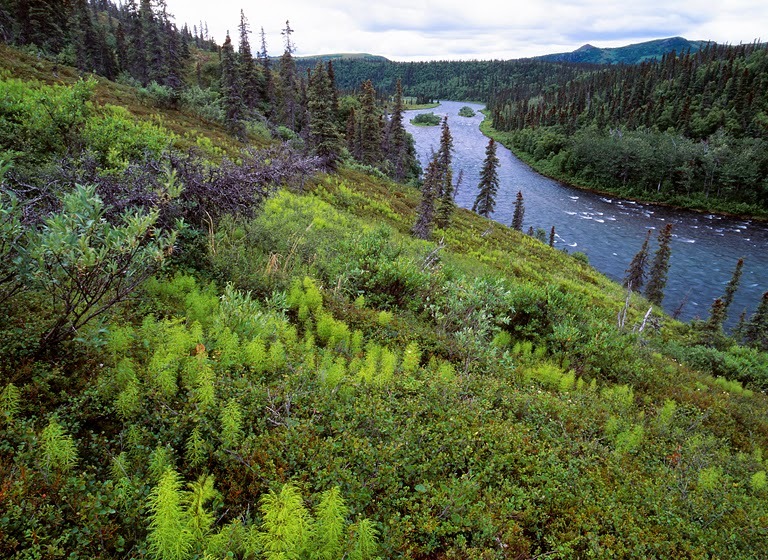 #Southwest #Alaska is one of the cleanest and most diverse #freshwater #habitats left in North America. As #clean #water #resources elsewhere are ruined by industrial consumption, #fracking, and bad #mining practice, perhaps we should prevent the PEBBLE MINE from "accidentally" impairing this huge clean water system. It is not JUST the #fish, PURE water will be more valuable than #gold in the near future. The state parks, national parks and wildlife refuges of #Southwest #Alaska are the essence of wild land. 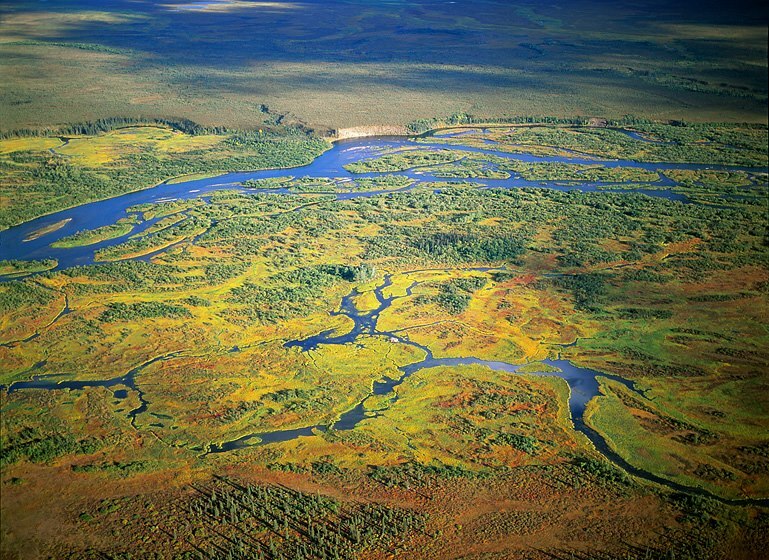 These habitats are also the #headwaters of the #BristolBay #salmon #fisheries and the most diverse #freshwater #ecosystem in North America. Parks and fish are renewable resource job providers. THERE IS NO PLACE IN THIS #ENVIRONMENT FOR THE #TOXIC BYPRODUCTS THAT WILL BE INTRODUCED BY THE PEBBLE MINE COMPLEX. #BristolBay, the most productive commercial #salmon fishery in the history of the world is not the only renewable resource at risk if the Pebble Mine is developed. This industrial mega-development will impact, 2 national parks (@LakeClarkNPS & @Katmai NPS), 3 national wildlife refuges (#Togiak), and 4 state-designated sanctuaries (#Wood-Tikchik) - home not just to #fish, but #bear, #moose, #caribou, #wolf, #walrus, #marten, #fox, #eagle and 1000's of migratory #birds. #Southwest #Alaska and the #AlaskaRange host many #volcanoes and are adjacent one of the most significant #seismic zones in North America. 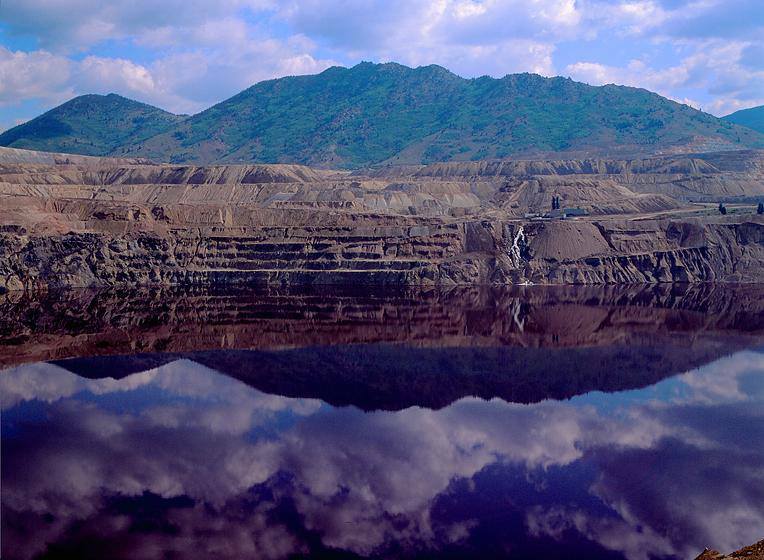 The Pebble mine plans to store #cyanide-toxic #mine #slurry in 20-SQUARE-MILES of plastic lined, lake-like pits supposedly contained IN PERPETUITY by a series of earthen dams larger than #ThreeGorgesDam located in #Yiling District, #Yichang, #Hubei province, #China. HELLO !?!?! 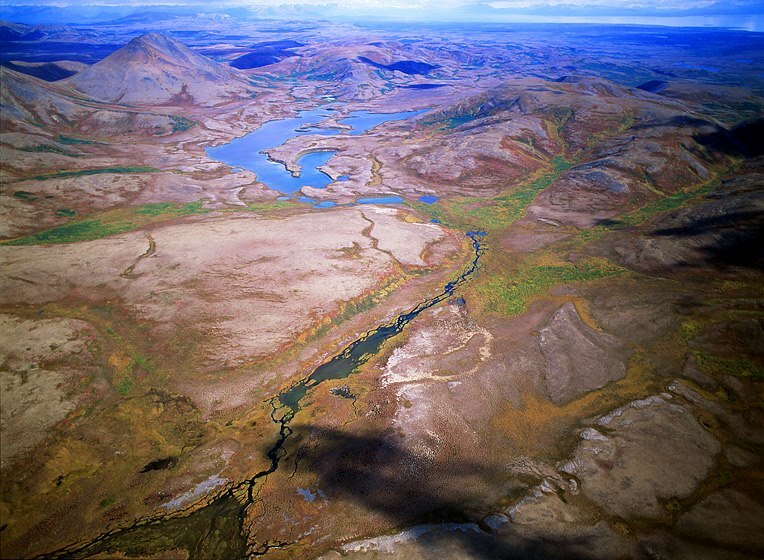 The Pebble Mine #ore deposit is apparently part of an ancient #volcano. #Lava flows and #volcanic #debris have built much of the #Southwest landscape. BENEATH THE POROUS STONE SURFACE, THE WATERS FLOW - sometimes literally THROUGH the rock layers. 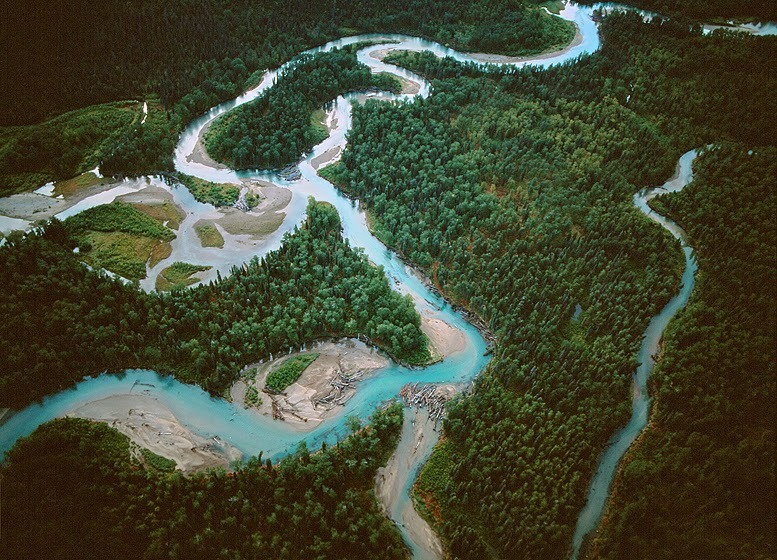 Many Rivers and watersheds are "connected" in this way. Containing any spills from the 20-SQUARE-miles of #cyanide #slurry lagoons created by the Pebble Mine would be virtually impossible. 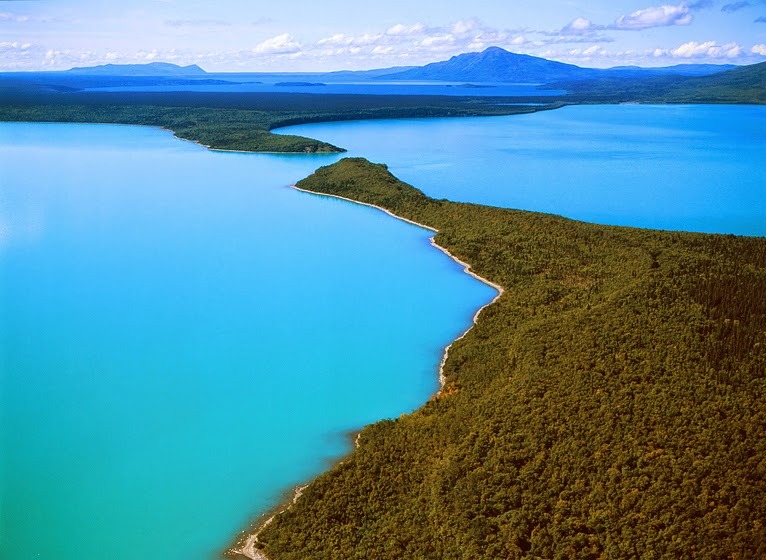 This is #LakeIliamna, one of the largest #freshwater lakes in the world and home to a unique species of freshwater #seal found nowhere else. #Iliamna is also the #headwater of the massive #Kvichak river, the most productive commercial #salmon river in all of #Southwest Alaska. ASTOUNDINGLY, THE NEARBY PEBBLE MINE WILL PRODUCE 3,000-pounds OF #TOXIC #TAILINGS FOR EVERY MAN, WOMAN, AND CHILD LIVING ON THE #PLANET TODAY, and to neutralize these #acid producing #tailings, the mine developers have suggested dumping the them in the lake!!! #Oil still oozes from shoreline sand in #PrinceWilliamSound. Oil and other #toxins saturate the #GulfCoast. #Cyanide and #acidic #iron #oxides should NEVER BE INTRODUCED into the #BristolBay #environment. Say NO TO THE PEBBLE MINE and keep the greatest wild #salmon fishery in the world (also #herring, #halibut, etc.) a clean American food and job resource. 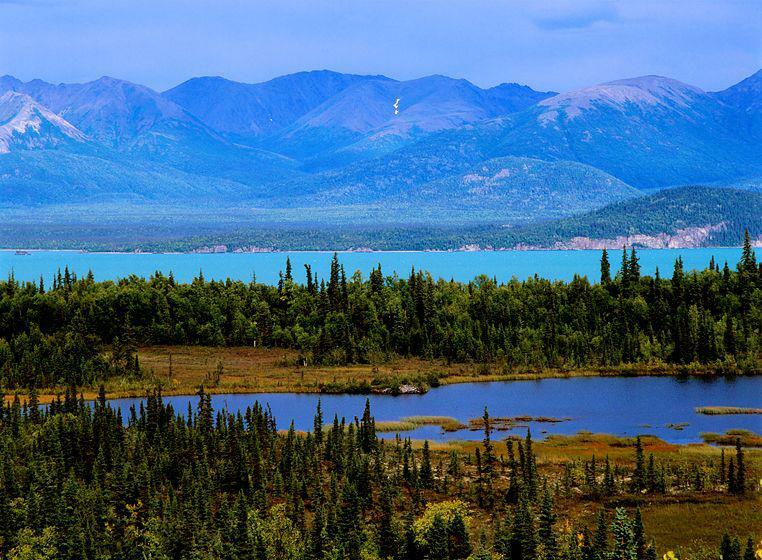 Don't allow #Southwest #Alaska to be trashed by international industrial development. If constructed, The Pebble will be the largest #open-pit #mine ever built, however in addition to the mine site a "haul" road system must also be carved through the 10,000 -17,000 ft #AlaskaRange to reach a port in #CookInlet (also to be built as part of the complex). GOOD LUCK KEEPING SUCH A ROAD OPEN IN THE WINTER! Will American taxpayers be deluded into subsidizing this road as they were for all the timber extraction roads in the #Tongass #rainforest (@TongassNF)? The @EPA has determined the Pebble Mine will damage #salmon #rivers, destroy salmon #habitat, and is a threat to the #BristolBay #fishery... THANK YOU!!!! This IS Ground Zero and you can see why a #toxic (#cyanide) #mine leaking / draining water downstream affects everything - follow the water in this picture (clue: it is where the life is). 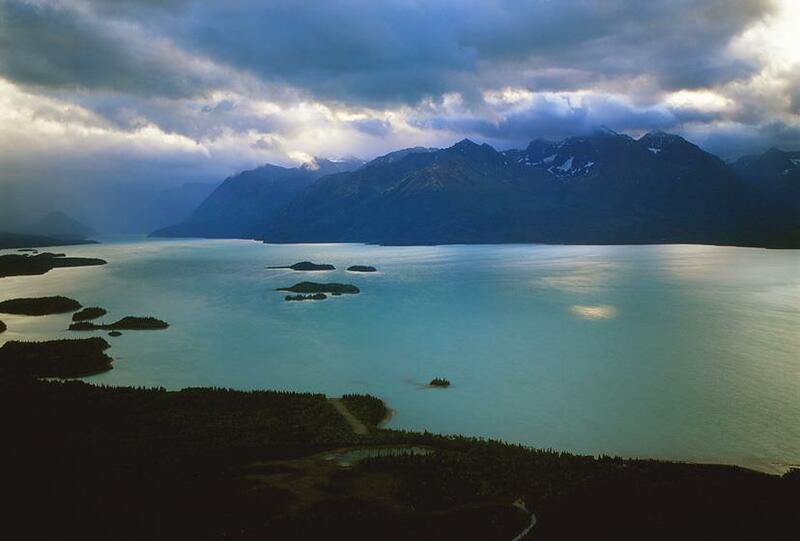 This is #TwinLakes in #LakeClark National Park (@LakeClarkNPS). Beyond the distant mountains to the right, the proposed Pebble mine complex would be belching industrial auto #smog, AND a #mercury laden #haze from #coal-fired power generation. Their 20-SQUARE-MILE #cyanide #slurry lagoon would seem ocean-like from shore-to-shore. How can foreign corporations be allowed do this to American resources? Besides a massive complex of roads that will define the Pebble mine #extraction site, a long "haul" road must be built to get #minerals out. The haul road will bridge the #NewHalenRiver coming out of #LakeClark National Park @LakeClarkNPS); it will run adjacent the shoreline of #LakeIliamna for miles bridging / disrupting dozens of #salmon streams and possibly the unique species of freshwater #seal that lives in the lake. 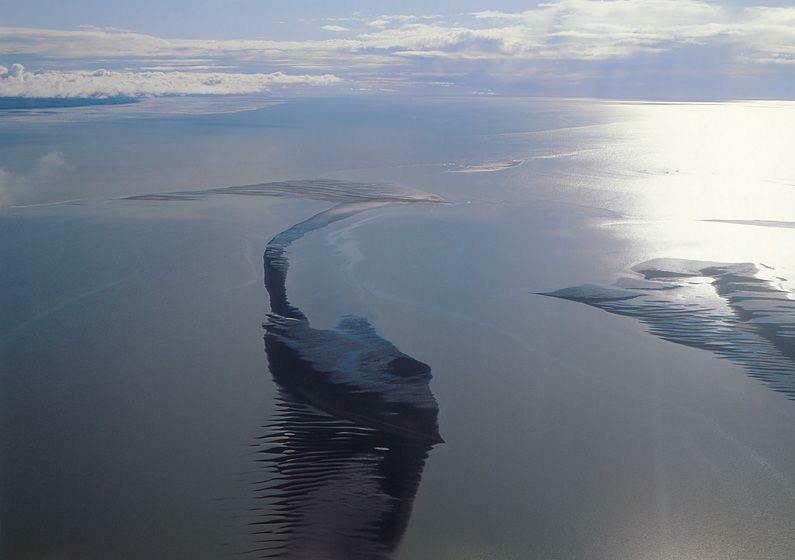 #Southwest #Alaska / #BristolBay is a world of water.... Water everywhere, and right at the surface. The fishery thrives in this world. 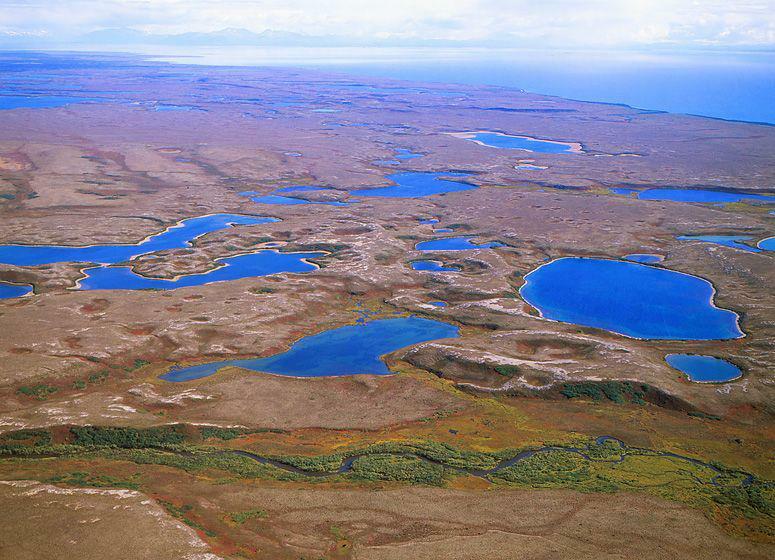 The Pebble mine, proposed as the largest #copper / #cyanide #gold-leach mine ever constructed has NO PLACE HERE! 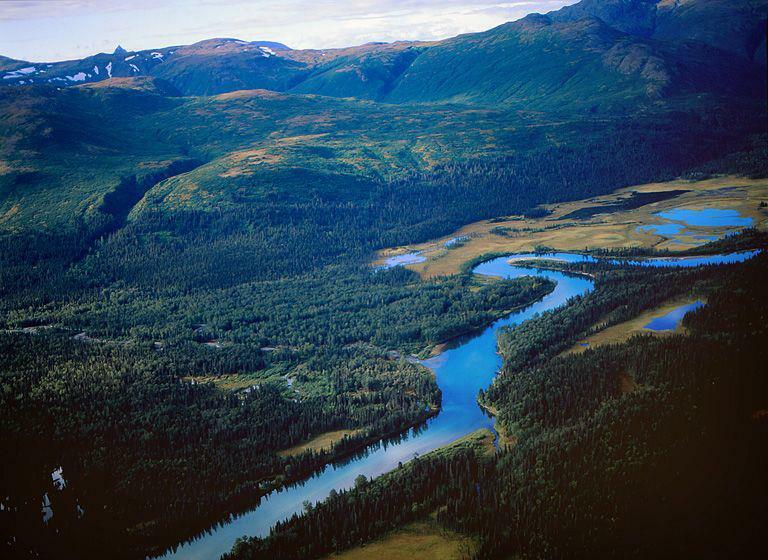 Keep American fisheries clean - say NO to The Pebble mine! The Pebble mine will use more electricity on a daily basis than #Anchorage, the largest city in #Alaska. The Pebble intends to generate power from burning #coal mined on-site. Coupled with the industrial vehicle #smog the mine will generate, you can kiss the air quality of #LakeIliamna, #LakeClark National Park (@LakeClarkNPS), and #Katmai National Park (@KatmaiNPS) goodbye... and good luck keeping the #mercury particulate from coal burning out of the fishery! The Pebble mine threatens American jobs and clean food resources say NO! The #NewHalen river flows between #LakeClark (@LakeClarkNPS) and #LakeIliamna, and offers some of the least tried Class 6 whitewater in North America. It will also have a bridge over it and a haul road next to it if the Pebble mine is constructed. Upper #Talarik Creek, a world class #fly-fishing destination. Recreational fishing / tourism generates $millions of annual revenue and American employment IN PERPETUITY if well managed. 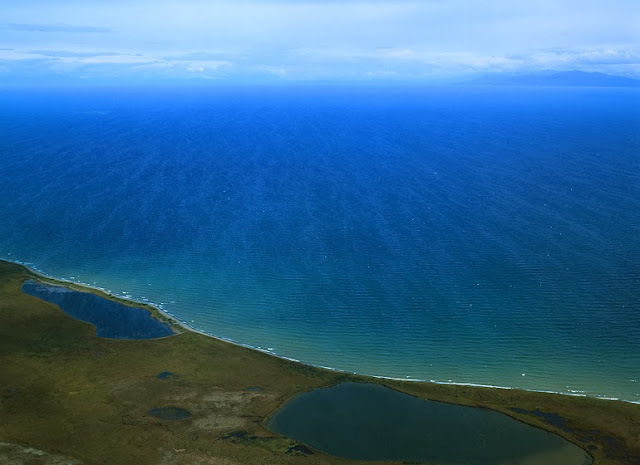 The Pebble mine's life will be short but it will generate millions of gallons of #toxic, #cyanide-leach solution which will have to be stored IN PERPETUITY to protect these #waters and the connected American #fishery. Today I am starting something new which I hope you will continue to follow, like and share so more will know about this: PEBBLE MINE - pictures from Ground Zero: This is #LakeClark National Park (@LakeClarkNPS) which will SHARE A BORDER with the Pebble mine. 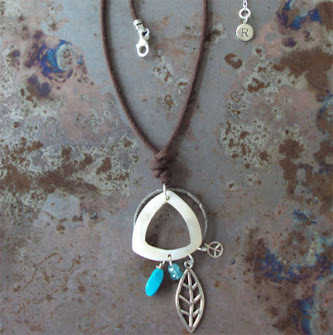 Should these kinds of American natural resources be squandered in the pursuit of fashionable jewelry?